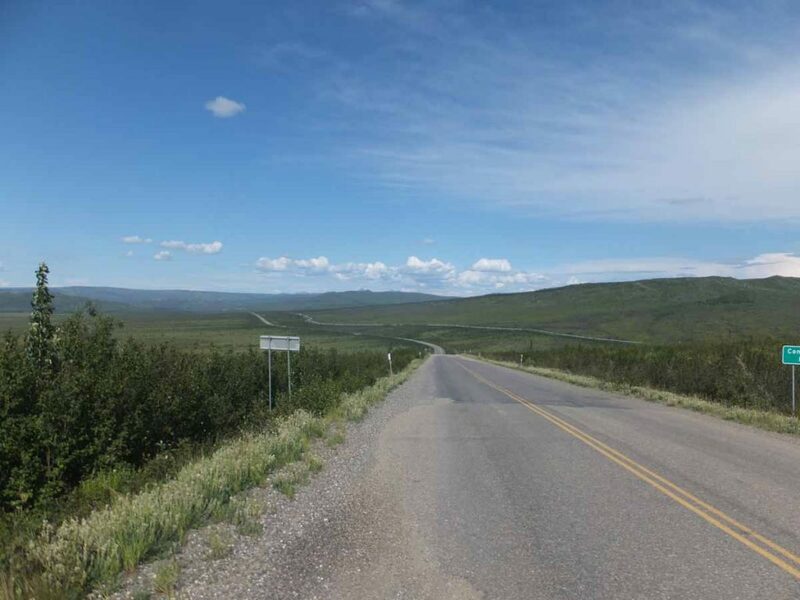 The road from Tok to Beaver Creek looked like a good two day ride of 113 miles. It would bring me across the Canadian border. There was settlement of Northway Junction at 50 miles so ideally find a spot just a bit further. The road started out both smooth and flat for the first 10 miles. My bicycle was gliding better now that I figured out that the rear wheel hadn’t been mounted 100% centered. 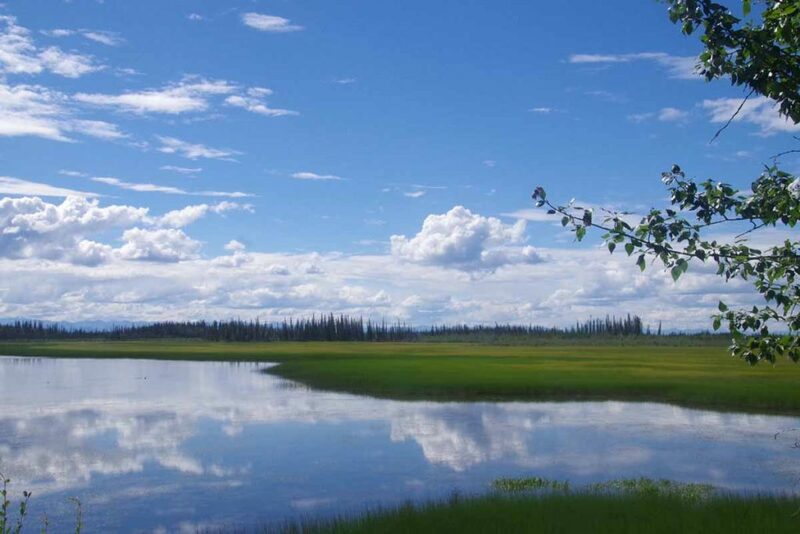 At 10 miles was the broad expanse of the Tanana River. I had been roughly following this river last few days and this was the last crossing. It was a wide bridge with good shoulder but there were also signed nearby of earlier bridges. 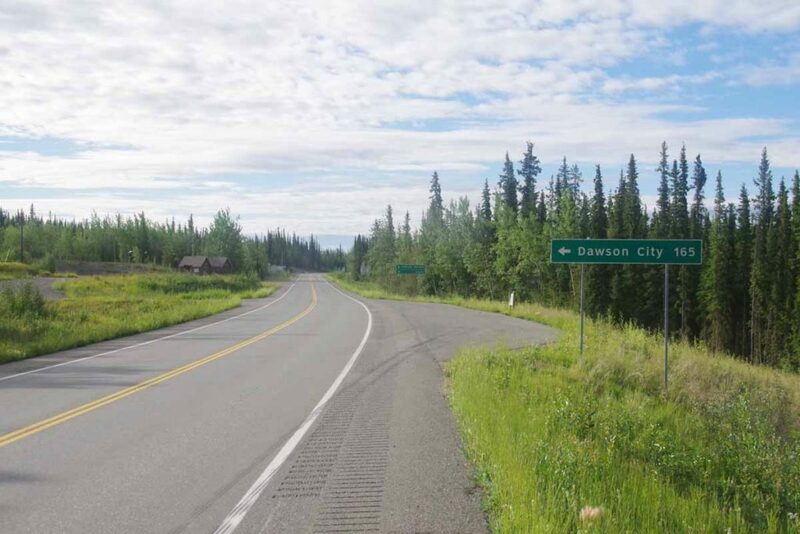 At 12 miles a road junction pointed to the Taylor Highway with roads to both Eagle and Chicken and then long way around to Dawson City. The latter went on a reportedly rough route known as the “top of the world highway” but I figured I’d stay on the standard route. After this point the road frequently seemed to climb up along the hillside only to descend a few miles later. There were multiple iterations and it made things just slightly slower. 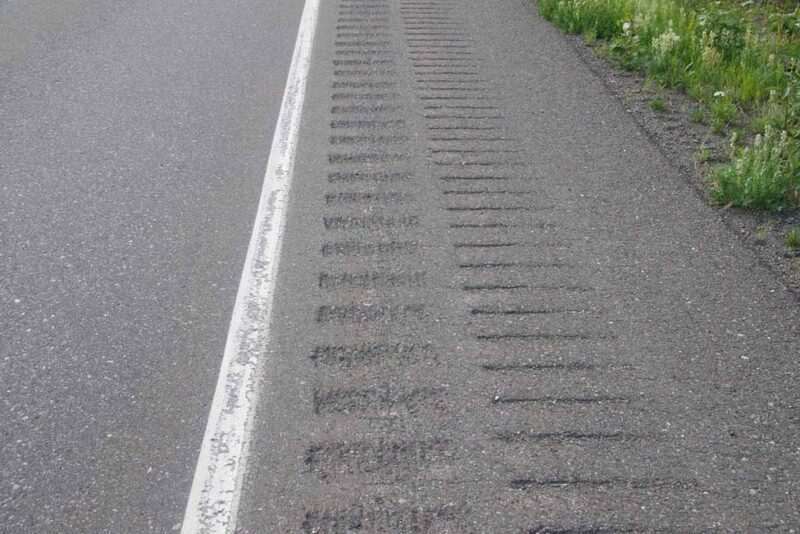 The road was generally smooth, though occasionally a perfectly reasonable shoulder got messed up with double rumble strips as shown at photo above. However, overall it was a beautiful ride and occasional trips along the mountain led to nice expansive views as shown above. 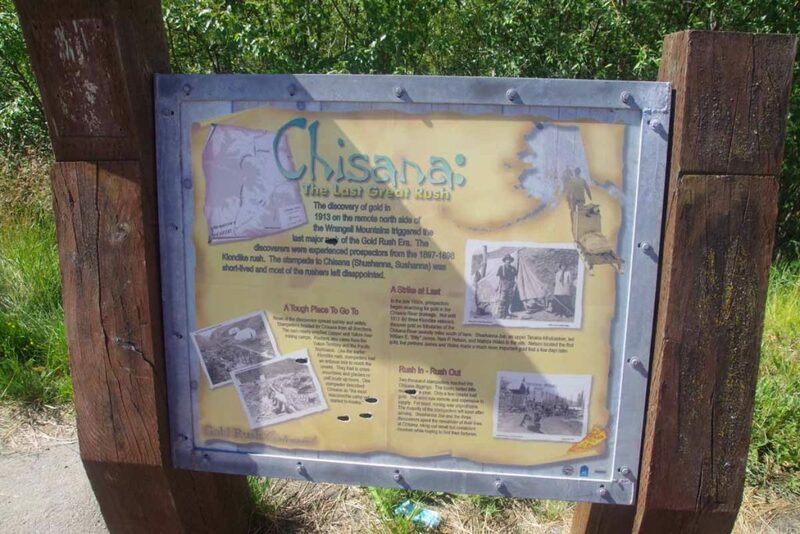 I came along several interpretive signs including this one that explained the last gold rush in 1913 in Chisana River area. The flowers seemed to be in full bloom. Also unfortunately a few biting deer flies. I needed to pay attention while stopped because they would take just a bit to hone in, but if you didn’t get them then the bite had a sting to it. Without too much difficulty I was at the Northway Junction store a little past noon. I had done 50 miles of pretty cycling. I took an extended leisurely gas station lunch as I heated and ate several items they had for sale. It briefly rained but nothing too bad. Finally after an hour and a half, I set off another seven miles down the road to the Lakeview Campground listed in “The Milepost”. It was a lovely campsite along the lake. 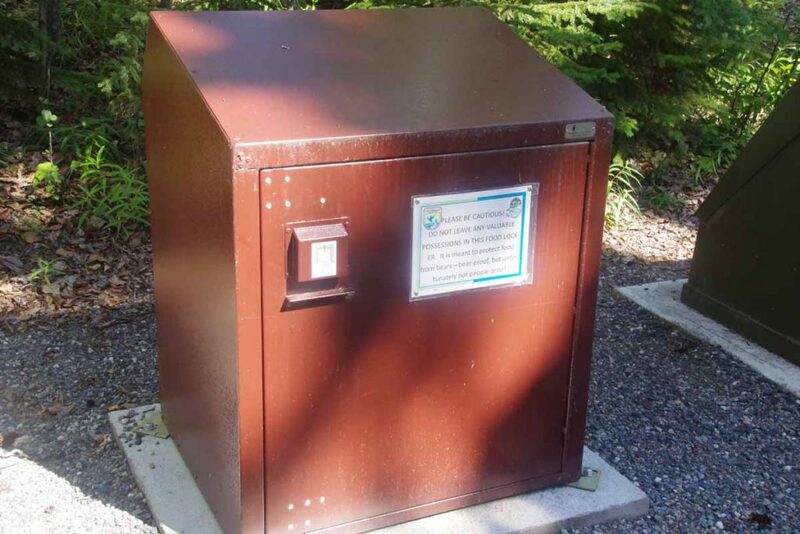 They even had a bear-proof container to put your food, complete with a label that talked more about humans than about bears. Not far away as a “bird blind” that was in shade and hidden that you could sit and watch the lake as well as the birds. It was a nice relaxing afternoon as I set up the tent, made dinner and otherwise relaxed. Overnight we had several storms drop through some rain, but all was dry in the tent. On the second day, I set off by 6:30am or so. The road continued its roller coaster hills though not quite as large as the day before. The overcast skies had fortunately cleared and it was good cycling. One intriguing thing I saw along the way were these conical segments supposedly as an experiment to see if they could help maintain permafrost and hence keep the road from settling further. 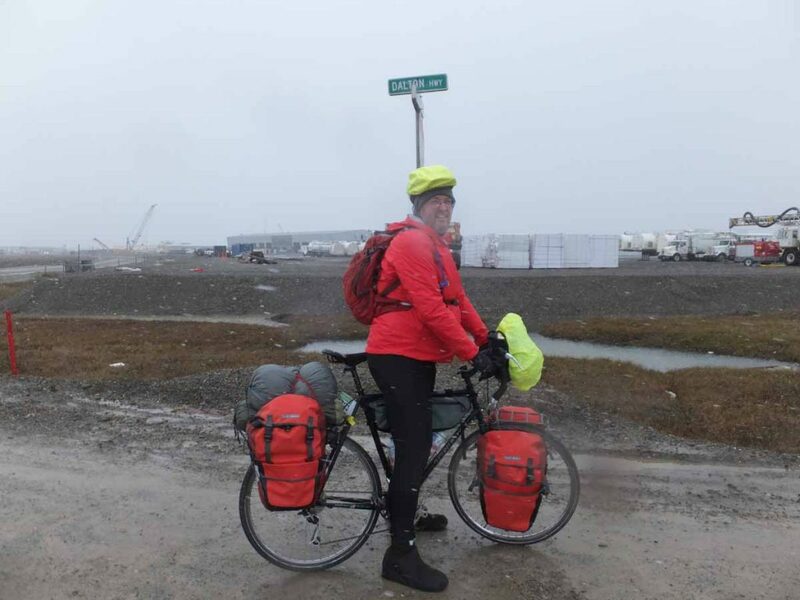 The overall theme started as “cycling to the border”. to the border city lodge. 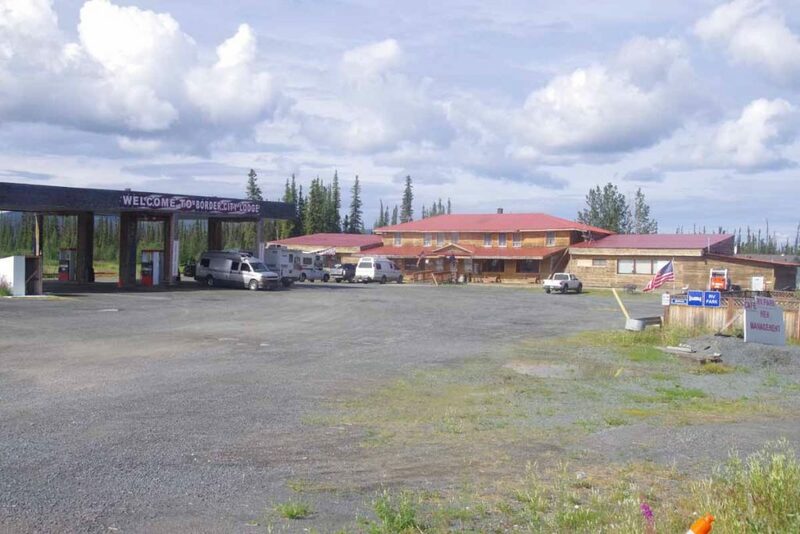 This was a larger roadhouse with motel, café and small store. Service was a bit slow, but I was able to get a cheeseburger here and refuel. After that I cycled the remaining 3.5 miles to the official border. 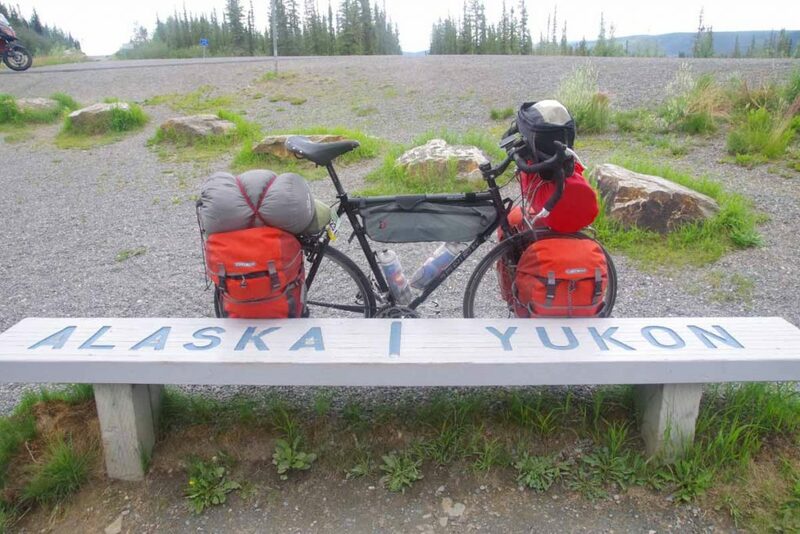 The photo above shows the bike half in Alaska and the front half already in the Yukon. Photo above is the obligatory border marker photo. What is more interesting than my photo is you can see behind that they’ve cleared the small path all the way along the border in the distance. 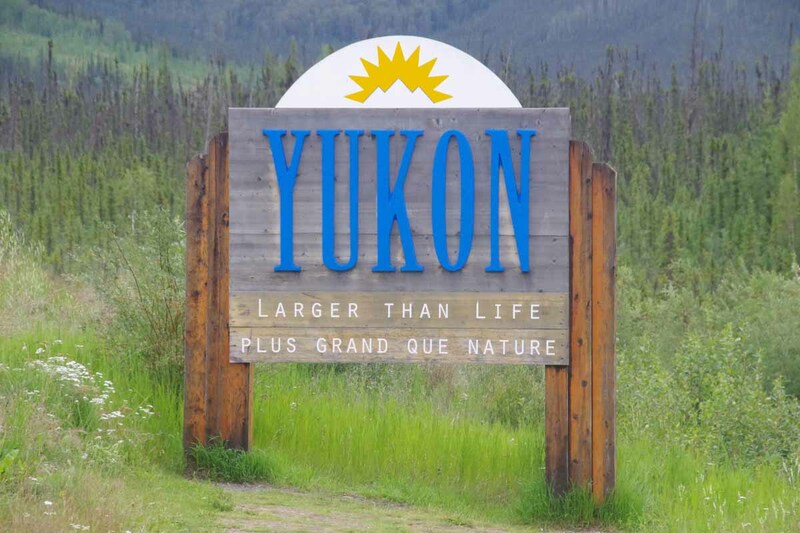 Picture above is sign for entering the Yukon Territory. These were all at the official border. 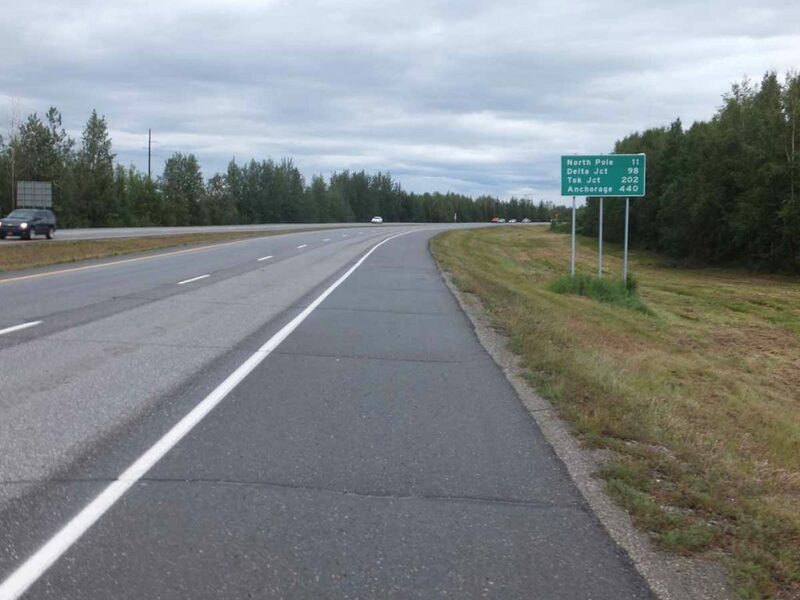 However, there were still another 27 km before I reached the official entry point into Canada. The first few kms were hilly and then it settled out better. Along the way, I came past the crew from www.viapanam.today a Belgian runner who is spending 22 months running from Deadhorse to Ushuaia. They had two of these little campervans which was fun. 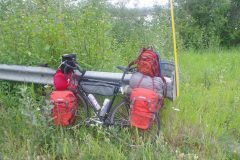 I cycled the remaining distance to reach the Canada Customs. They had some standard type questions such as whether I was bringing tobacco, alcohol, firearms or weapons including knives, bear spray into Canada. They also did a rough set of questions of whether I would be financial burden, e.g. did you have enough $ (I listed cash as well as ATM), that I wasn’t working but did have a house rented. They asked if I had visited any other countries in 2016 and then thumbed through my passport and noted the Khartoum (Sudananese) visa so I noted that was part of an African cycle trip. Fortunately with that conversation I passed the test and was on my way. I did specifically request a passport stamp. Found a motel in Beaver Creek and got my clothes cleaned at local laundry. First night the wifi was having problems, something about having upgraded their phone service. However, I separately decided to take a rest day here and on second day the wifi was now working. I’ve cycled six days and plan is now to take a rest day before tackling a similar distance from here to Whitehorse. Theme for last two days has been “riding to Tok”. It was nice and restful in the motel but particularly appreciate ability to pull the blinds and get some dark. I didn’t get on the road until 7am. 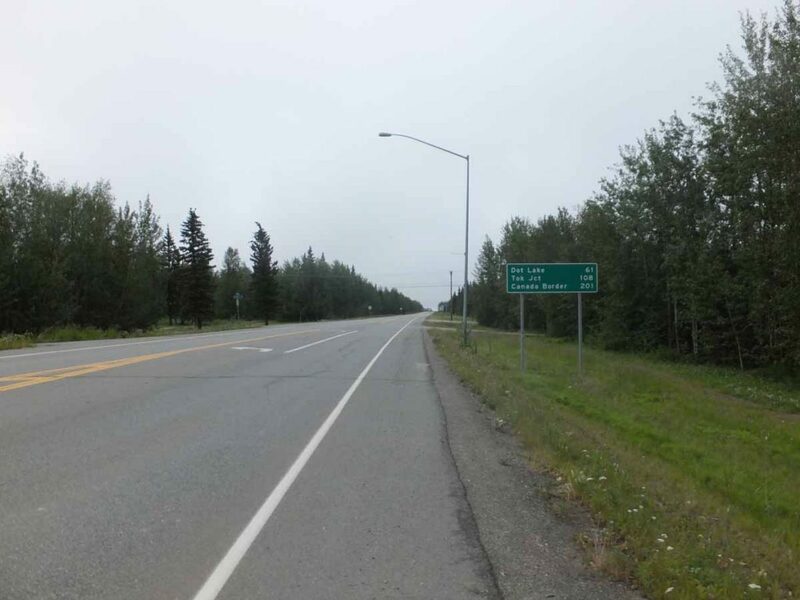 I cycled to the road junction and sign above gives the basic overview: 108 miles to Tok with an intermediate point at Dot Lake. 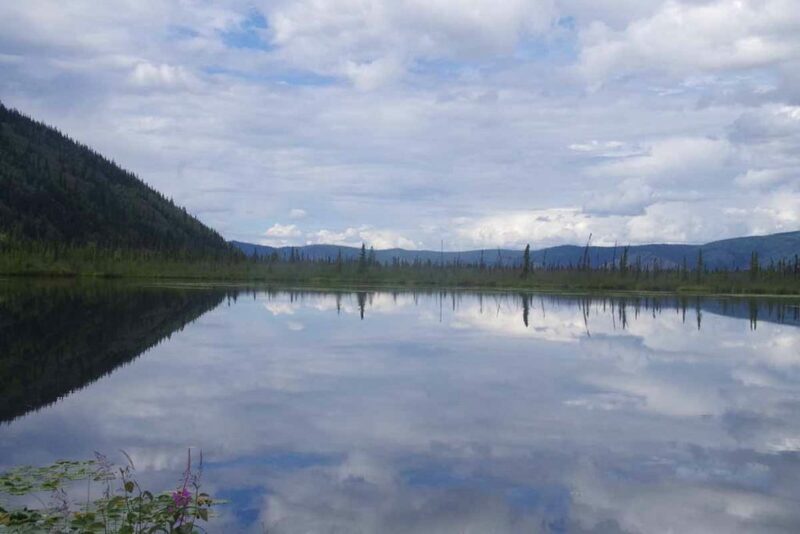 Hence, the general idea was to get to Dot Lake the first day and then ride into Tok the next. The road was flat, smooth with a very gentle incline. I saw a moose crossing the road in far distance but not close enough to get a good shot. Otherwise not extremely scenic as the clouds obscured the Alaska Range and otherwise was a flat road through the forest. Ten miles out, I came past the establishment at photo at right. During my last trip in 1997, it was named “Cherokee Lodge” and I had stayed overnight. Several of the places I stayed before no longer have lodging. I get the sense the largest population passes through with RVs and others might stay in other places, hence some of the older lodges have gone to other uses. It is interesting comparing notes with my trip from 1997 as can tell that I’m not quite a strong in cycling as I was 19 years ago. Some is probably also myself and bicycle are a little heavier than on that trip. However, still gives me some interesting comparison points. At 18 miles was another spot indicated “Silver Fox Gas and Snacks”. Again, didn’t look like much to stop since the pumps were automatic and the associated store really wasn’t open. Still useful to keep in mind as hard to tell in “The Milepost” how many of these establishments are actually places to stop. The road crossed the Gerstle River near mile 25. An impressive bridge shown above. What I was at least as surprised about was the river channel was rather large with a braided river going down. There was plenty of sediment and the channel could wind back and forth. This would make it more difficult to filter water since filter would quickly get clogged. Fortunately, I had plenty of water otherwise. In general, I tried to camp close to streams so I could fetch/filter some extra water. North of Fairbanks there was water everywhere and not much difficulty. Since then, one pays more attention to the little streams for water quality. After Gerstle River some more ups and downs. Also the road seemed to have more deep cracks. Thump, thump. I cycled in the lane (and then checked my mirrow to get out before traffic), but still some jarring thumps. Also had a brief shower before reaching Dot Lake just around 2pm. Overall a nice and not too difficult ride. Photo above was my lunch stop. Leaned the bike against a bridge support. Unloaded the bear proof container in black and got out the crackers and peanut butter. Services had just started so I went into the church. There were five pews and total of seven adults and three children. Initially they seemed to mostly work through different hymns, some by request. At some point realized the pastor had been called away on a semi-emergency and he came back in the middle. He gave brief remarks about Psalm 15 and then otherwise prayer requests and things people were thankful for. Overall a nice service and fun to catch it in the act, particularly in this small church. After service, I asked if it would be OK to camp by the lake. No problem, so I set up my tent not too far from some construction piping. There was a 13-mile segment of road construction around Dot Lake, but fortunately other than some gravel patches nothing too bad. It rained overnight but at least clear in the morning. It was light overnight and in the morning I had a good chorus of howling dogs My guess is these are the winter sled dog teams. I walked briefly to the post office (closed) and otherwise saw the school in town. Not too much else to describe this town. Next morning, 4th of July I was on the road not too late. I cycled the remainder of the construction. Again some gentle rolling hills today but nothing too severe. 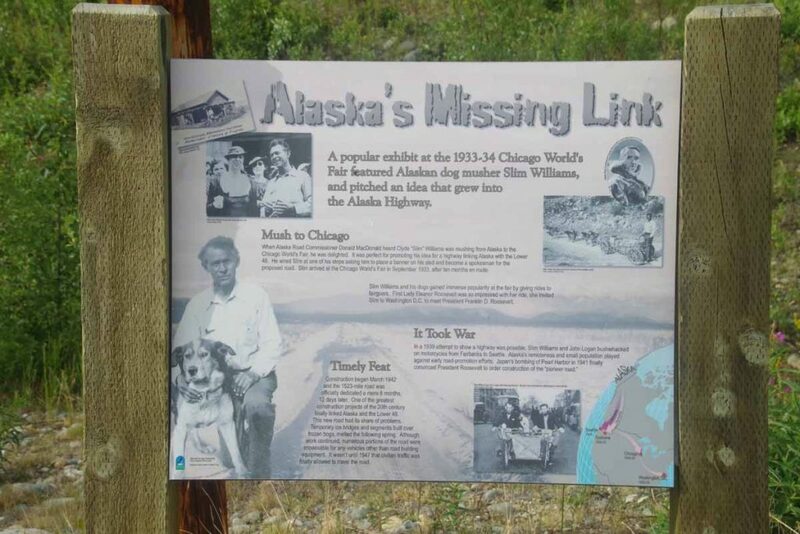 There was a nice rest area 17 miles in with a good set of displays including this one describing early promotion efforts at the Alaska Highway. While it had been promoted for a while, the second world war was impetus to quickly build the highway (in something like 10 months), though it wasn’t until 1947 that it was open for civilian travel. Since then it has been paved and greatly improved. As I was riding, I could sense a radial asymmetry. Hence, at the rest area I took a good look and noticed that the sidewall from the tire was starting to rip. This isn’t good as at some point one goes over a particularly large bump/crack, the sidewall rips, “pow” inner tube goes out. I had two spare tires with me, one from the start and a second I had included in my Fairbanks care package. Hence, decided to swap in a brand new back tire. The one I took off might still work in an emergency, but doesn’t have a huge life left. Nice riding after that, though the bike definitely feels a bit sluggish. 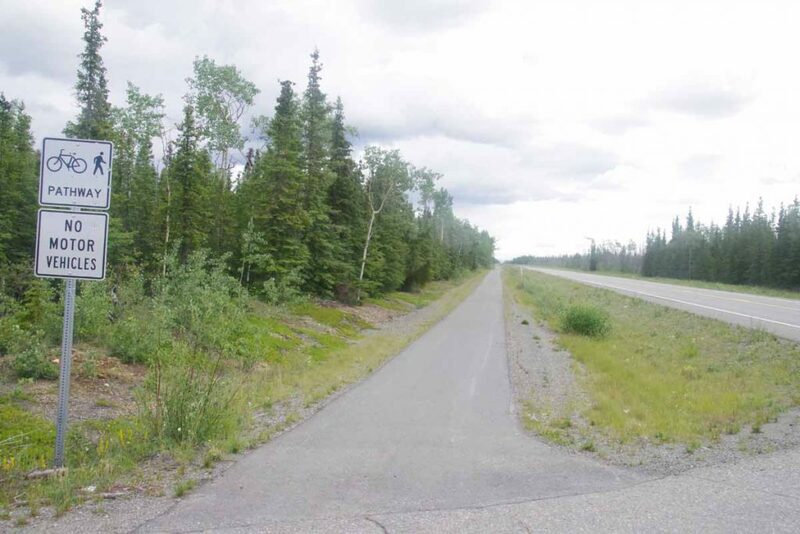 At 11 miles from Tok, this bike path appeared on side of the road. It was also pretty level. Hence, cycled the last 11 miles on this nice path. Overall, Tok was pretty quiet for 4th of July. Some festivities down the road, though didn’t find them. I did find the grocery store which was fortunately open and chance to get some lunch. One of two restaurants is open and will find it for dinner this evening. Overall, two not extremely difficult days but some good riding as I started the Alaska Highway. I’ve had intermittent showers both days but at least not a deluge. Now also time to check the map and figure out how to go along the next several days ahead. Yukon River. 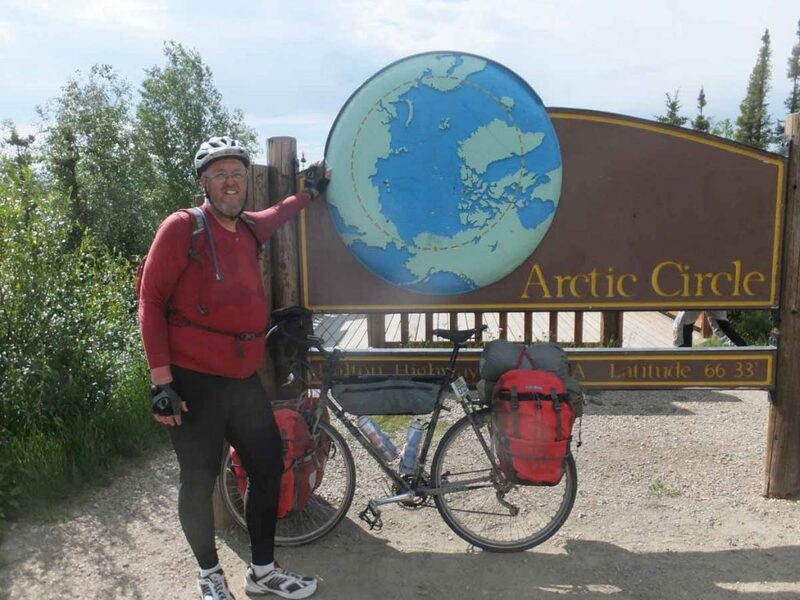 A purist approach would be to get the bike back to Yukon River and come back cycling from there – covering all the distance. That had some logistical issues, particularly getting myself and bicycle back and some risk of getting caught back in mud again. It would however, be the “purist” thing to do. 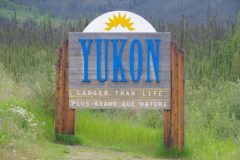 In the end the reason that tipped the scales here was I just wasn’t that excited about the gravel between Yukon River and end of the Dalton Highway. So guess not being a purist here. 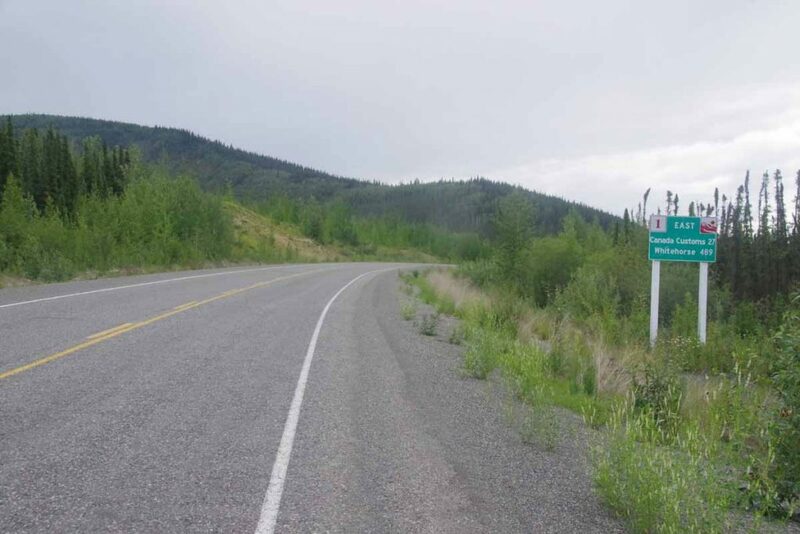 Cycle the Elliott Highway back and forth. Take a three day trip up to the start of the Dalton and back. Would cover at least some of the missing gap and also have a good shakedown before departing Fairbanks again. 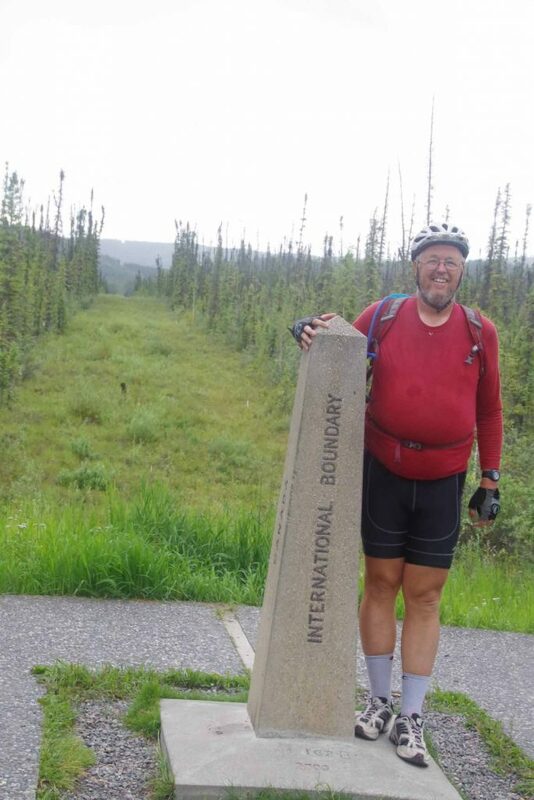 Start cycling from Fairbanks southbound towards Alaska Highway and towards Watson Lake. I was most serious about the last two and not 100% decided until last minute. 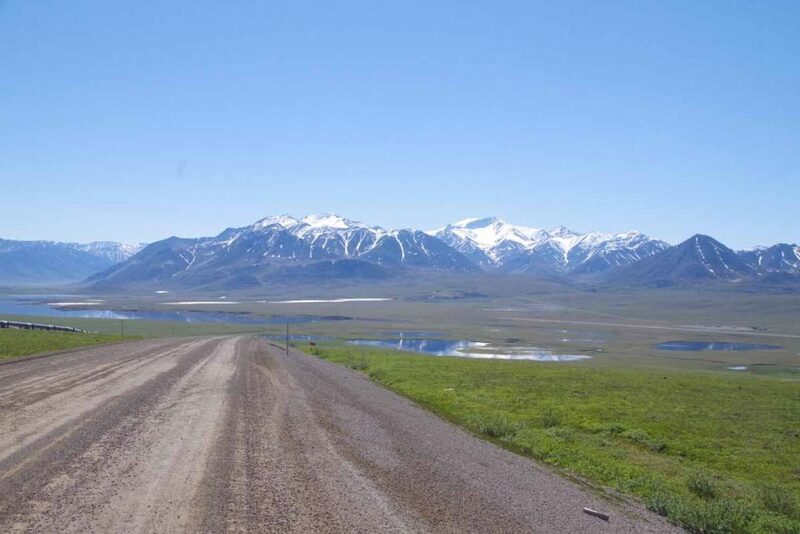 In the end, I started down from Fairbanks, partially to get some reasonable travels down the road and start a track record from here. It does mean there is a “gap” in the travels and that is just the way it will end up being. 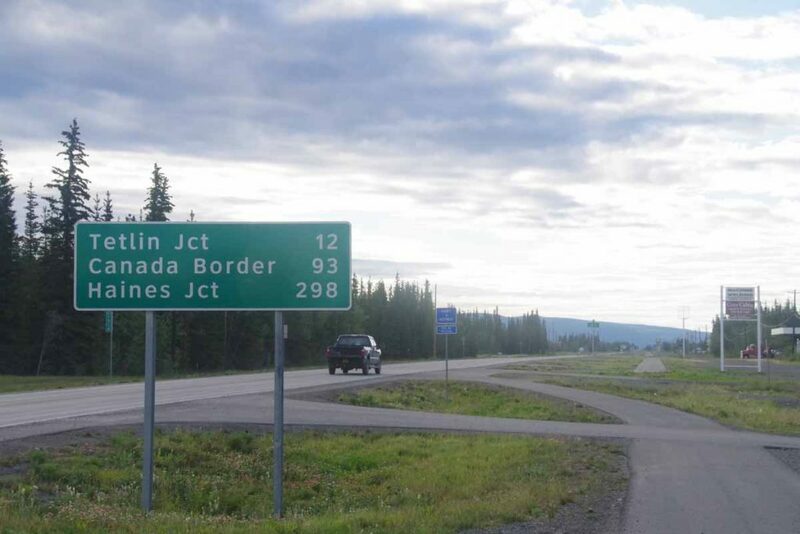 It also gives me ample time to get first to Whitehorse and then further down through British Columbia. 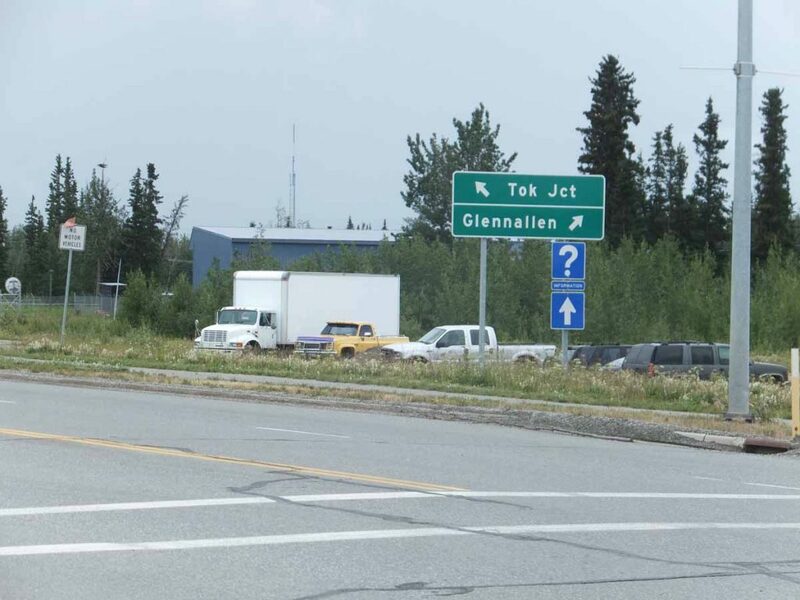 It was nice to just get some riding in and make sure all was ok.
Airport Road through Fairbanks was signed “no bicycles” so took the frontage roads for ~5 miles before reaching the main intersection of Steese Highway and Richardson Highway. For the next 25 miles the road was a four lane divided highway with reasonable shoulders. 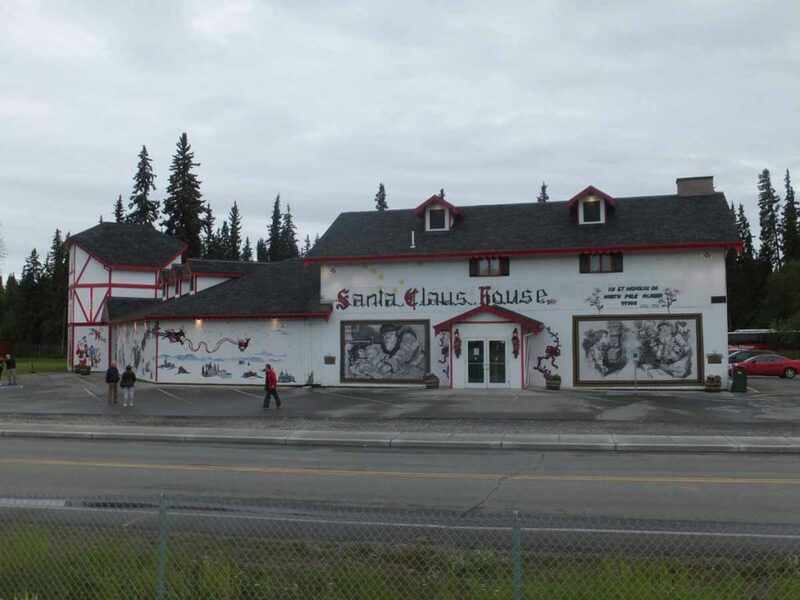 I stopped at mile 13 in North Pole for a bite to eat. This was also site of the “Santa’s workshop” shown above, though I didn’t stop there. At 25 miles the route took me past Eieleson Air Force Base including past a very long runway. There were signs about “No stopping, no standing, no photographs” for the highway traffic. The weather had been on verge of raining and rained a little more when I stopped at Salcha Store at mile 30+. A woman with pickup looked at my bike, shook her head and suggested in this rain I’d be better off putting the bike in back of the pickup. I thanked her for her concern and pedaled along. 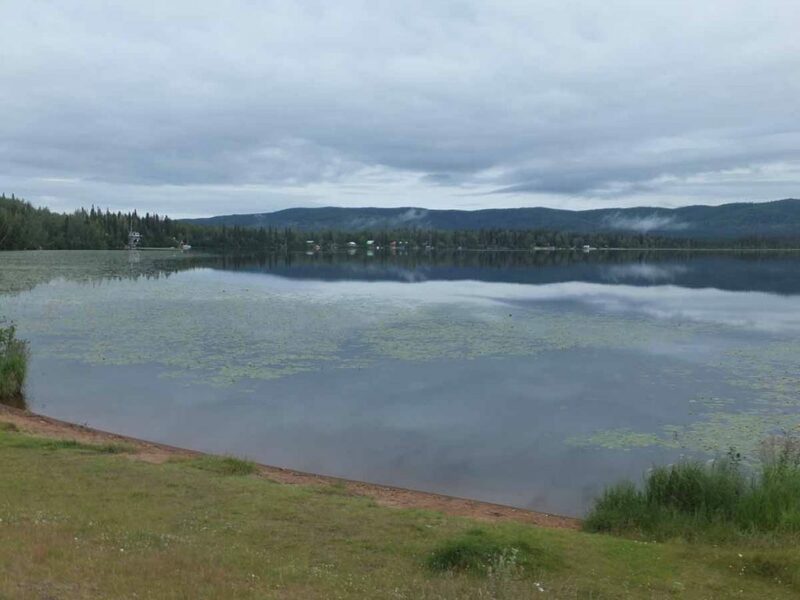 Overall the route was fairly flat on first day and it wasn’t very late as I came past the C Lazy Moose RV park. Just past that was the “Midway Lodge”. 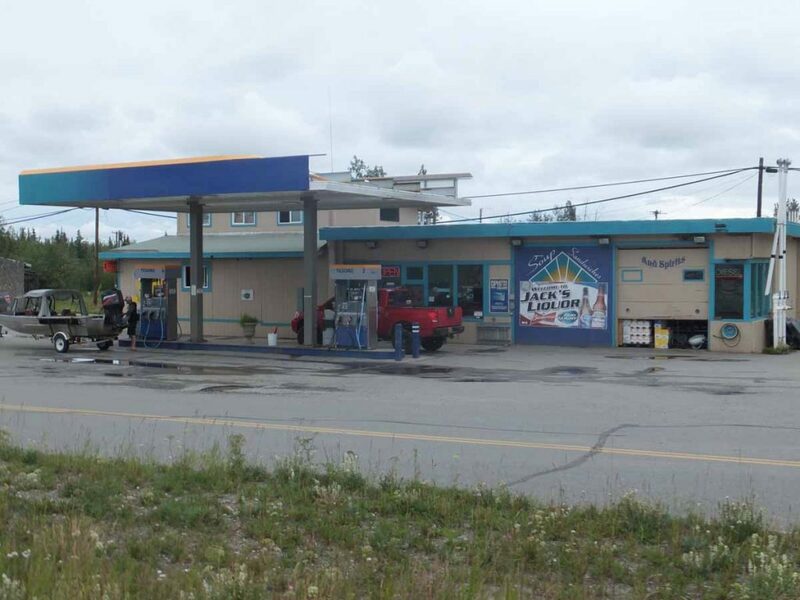 I had stayed at the Midway on my trip down the Alaska Highway in 1997. It now looked a bit run down and was no longer an operating commercial establishment. 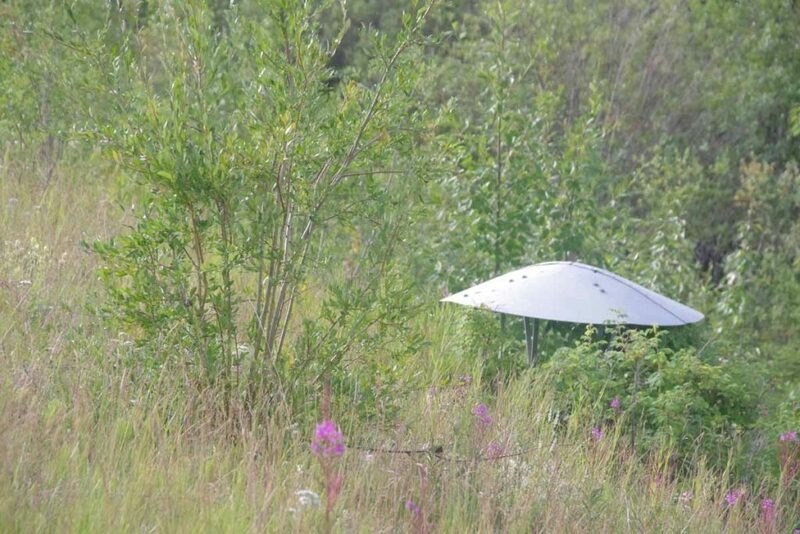 Hence, circled back to the Lazy Moose which had a tent site and also boasted of showers. An early end to a not particularly difficult day, but wanted to just get some riding in with load. We got another good downpour in the evening. Saturday morning and back on the road early. The second day had several longer hills and also had some good showers as well. Nine miles in I stopped at Birch Lake shown above. Multiple vacation homes in this area, but still quiet on the lake. Photo above taken at a rest stop at mile marker 298 shortly before a climb over Tenderfoot Hill. You can see the red duffel that surrounds a bear canister on the front pannier. 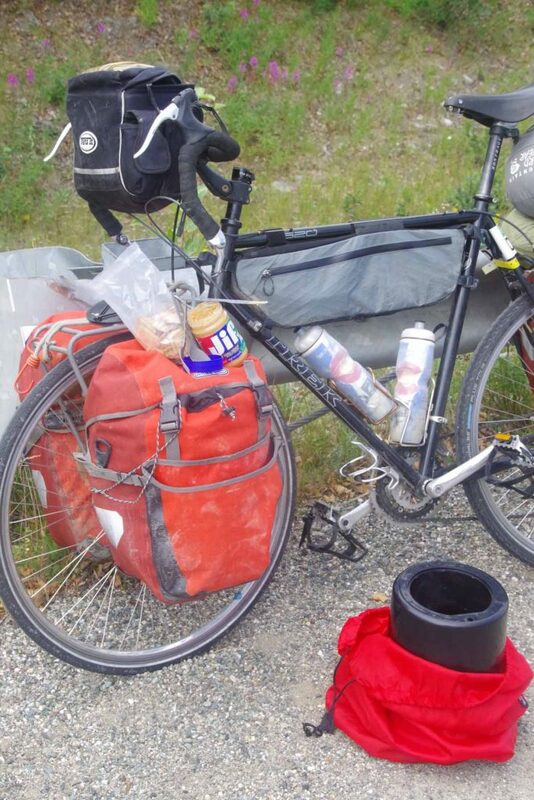 I’ve got my food in that canister and now instead of as food pannier, have a laptop and odds and ends pannier. By now everything has its place. Tenderfoot Hill was approximately a mile and a half of climb. By the time I reached the top, the rain was coming down hard so put all my covers over camelbak, front handlebar bag as well as my jacket. A few miles of descent and after that the rain subsided. The last miles into Delta Junction were relatively flat. 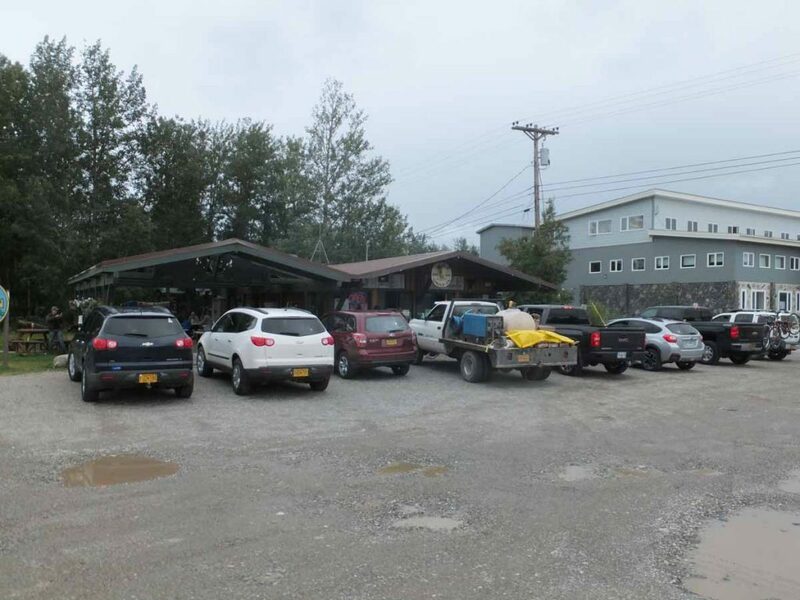 I had seen a sign for a “Tesoro Gas Station” at 40 mile point and was looking forward to stopping there for bite to eat. 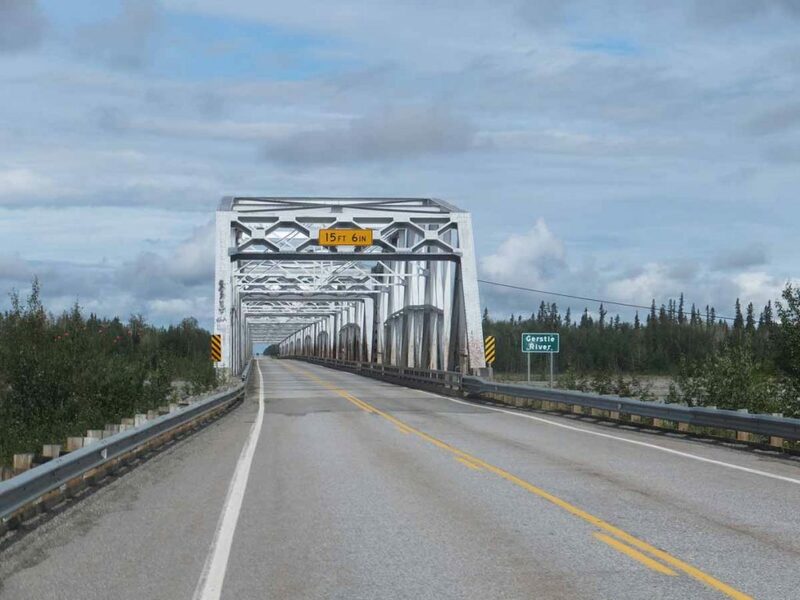 I crossed large bridge over the Tanana River and saw the gas station. Unfortunately, it was only a gas station and no other establishment. There was a closed lodge next door. So I cycled the last little bit until I came to the road junction that marks center of Delta Junction and found a motel nearby. Overall two fairly easy days of riding, though also somewhat wet. Nice to get some real road riding in from here. 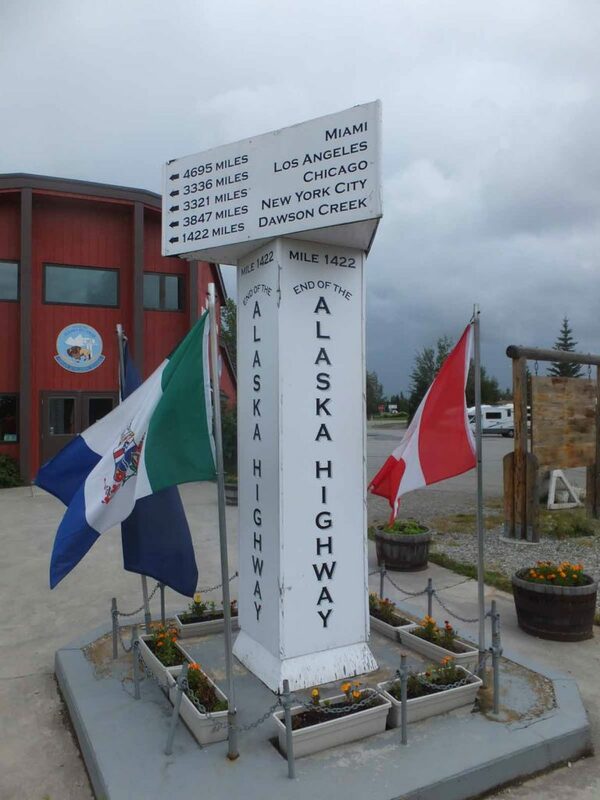 This spot is also the end of the Alaska Highway (or more precisely the northern start for me). Stopped in at the visitor center where they raved about the “drive in” that was just a little further south. I walked that way and saw the sign “drive through” and went inside. Asked if there was a place to eat and they cleared some spot. Overall they had some frozen items in a case and a microwave. It didn’t seem as exciting as people had reported. 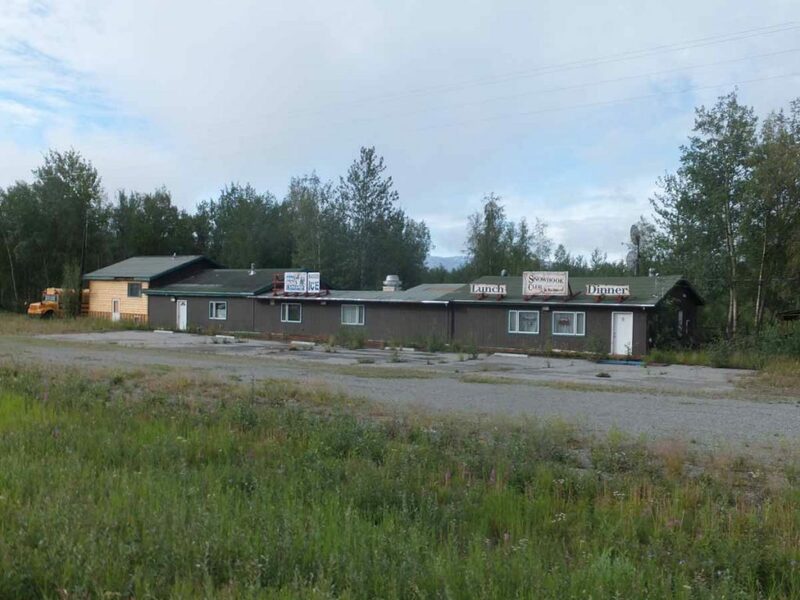 However, once I walked a little further south, I found the original intended location: the Buffalo Drive in – not the drive through Liquor Store with convenience foods I had found first Once I cleared that up, I agree it was a better meal for this little town. Multiple loose ends sorted out today. Started by going over to auto rental place that advertised on cars allowed on the Dalton. Paid a little extra, but then also felt covered. Plan was for a one day rental to retrieve the bike. Drove back up to Yukon River without incident and was there a little before noon. Also met the Swiss cyclists there, they were just starting their day. Had lunch with them and then drove back to Fairbanks. 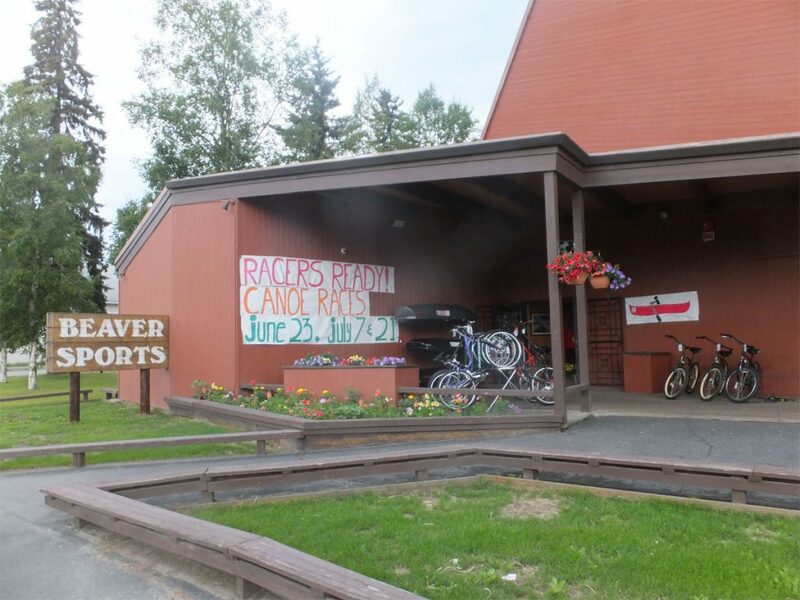 Dropped the bike at Beaver Sports Shop. Initial timetable was not favorable as they could put me in the normal service queue and get to it by eight days later on July 6th. I was willing to pay extra for some expedited service but didn’t hear until later that this will likely be two days from now on Thursday. Much better. I also promised to drop by some spare pedals which I had sent in my care package. Had some time, so now needed to find that care package. I had sent it from a UPS office to a General Delivery US Mail address. So first found the main mail facility near the airport. They told me General Delivery was instead handled downtown. So went to the downtown post office. They looked and couldn’t find the general delivery package. They suggested trying with UPS since they don’t accept general delivery from UPS. So tried to find the UPS office and ended up back at the airport post office for better directions. Drove out to the UPS office and they had some strange hours (10:30am-12:30pm and 7pm-8pm) but there was someone there who was helpful in getting me my package. Picked out the pedals and dropped by the bike shop where I learned the expedited timeline wouldn’t be before Thursday, but still better than first reaction. Hence, at this point I am here until at least Friday morning. My care package had a bunch of stuff and some of this I’ll trade for other things I had. For example, need to carry less food at a time from here and may not need as many warm clothes. However, will see how much additional I add and what I perhaps mail away again. Nice to get this further sorted from here. Sent away a some extra warm clothes such as extra down sweater, extra gloves, etc. I had sent a spare set of pedals here. I knew I was starting with older pedals and wasn’t completely surprised they fell apart. However, I figured I would start with the older ones just to keep from changing something last minute – but then ship them here. Turned out to be useful. One additional item I now have for the bike is a “bear canister” up on the front rack. While it will be rare that I am more than a day from a store, I can put food in it for overnight camping and then leave it a ways from the tent. I had originally thought of bringing the bear canister also on the Dalton but ran out of “space budget”. In particular, I wanted to carry no more than one pannier with all the food and this couldn’t fit along with the canister, so waited to get it until Fairbanks. Otherwise nice to be ready to roll again. 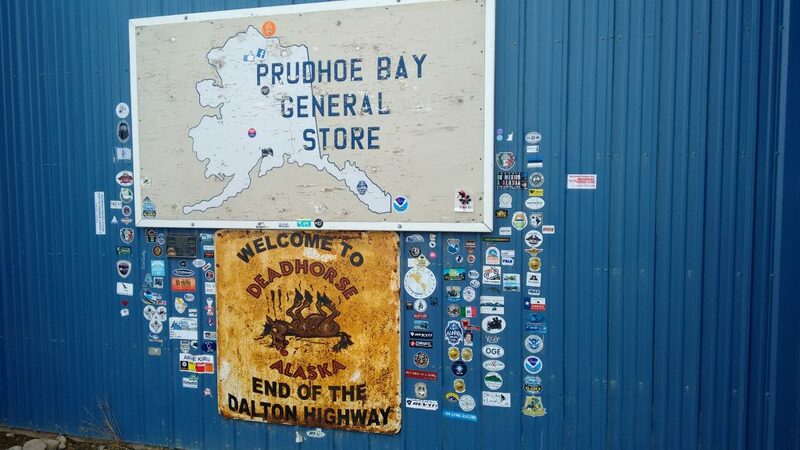 Above is my official starting photo on edge of the Dalton Highway in Prudhoe Bay. Our weather forecast had said a brief but intense storm was going to drop 0.25″ of rain followed by 1″ of snow. Rain would start around midnight and worst of the storm by 10am and chances less than 50% after two pm. With that in mind, myself and Dhruv from India agreed to check at 7am and if still looked ok, depart around 10am. By 10am, it was still snowing and turns out the forecast was wrong as it continued until well into the night. I was slow but turns out Dhruv was cycling a bit slower. I stopped to wait a few times, but at some point also agreed that we would continue and try for the likely target at mile 455 (60 miles down the road). My odometer today was in km and at 23km I came to the first road construction. They explained to me that I had two choices: load the bike in the pilot car or wait until shift change at 6pm. It was cold, the road would be soft and I was in no position to argue, so waited for the pilot car and rode across this 4 mile segment. It was followed by a second 8 mile segment, but unfortunately they weren’t coordinated, so ended up waiting for quite a while until the car came. It was good cycling past the construction, but it continued to get feel colder. By 90km there was a brief period of pavement but also some climbing. The snow was starting to stick to side of my pannier. 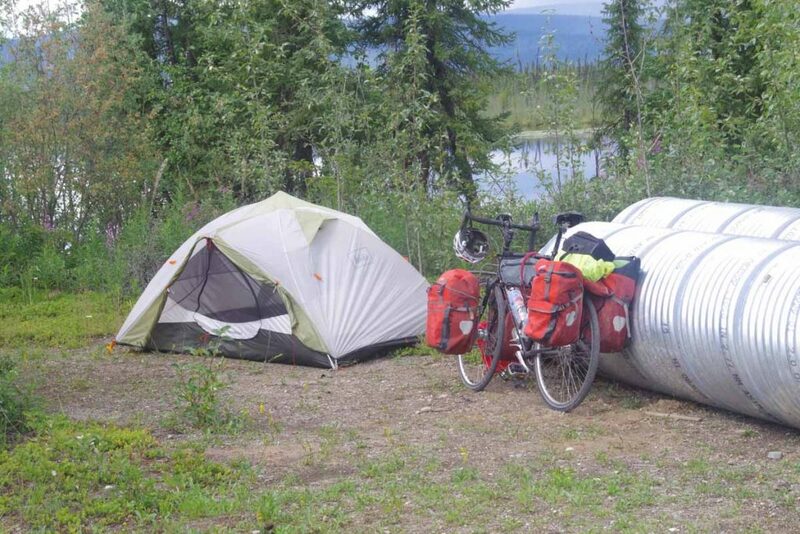 I saw two tents and bicycles besides the road. I didn’t know it then, but these turned out to be two cyclists from Sweden. Finally as I got closer to top of hill, I found my destination, this pit toilet. The door was welded shut but it gave me a place to shelter from wind and pitch my tent. It was tough since I was quite cold. I couldn’t get the drawstring from my tent undone. Finally got out a knife and cut the drawstring. Got myself into the tent, put over the sleeping bag and shivered for a while. I hadn’t eaten much, so figured I would need to get some food in me. Got the stove lit and boiled some water for a freeze dried package. It was ok, but still feeling hungry, I put two packages of oatmeal in the mostly empty bag and got some oatmeal as well. Suddenly felt sick and threw up. Oops there went dinner. Got myself as best I could and collapsed in the tent. Still cold but ok.
Woke up to pretty sight overnight. The snow had stopped and it was a white world. The road continued with a few more climbs and descents today and it was warmer. Just having the sun out helped a lot as well. Dawdled around camp including filtering some water before setting off around 7:30am. Pow! 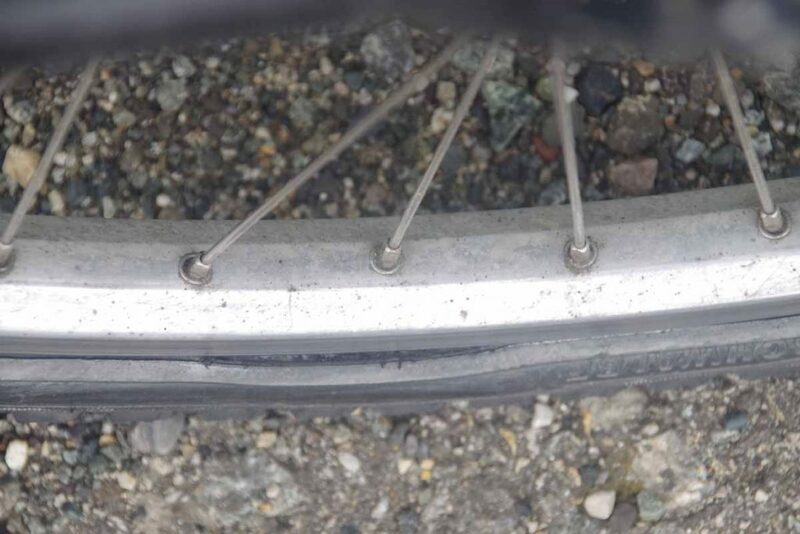 My rear tire suddenly went flat. Not sure what happened but the valve stem was broken off just past the lock nut. Oh well, start the day by replacing the tube and then going again. Fortunately, I had three spare inner tubes with me. 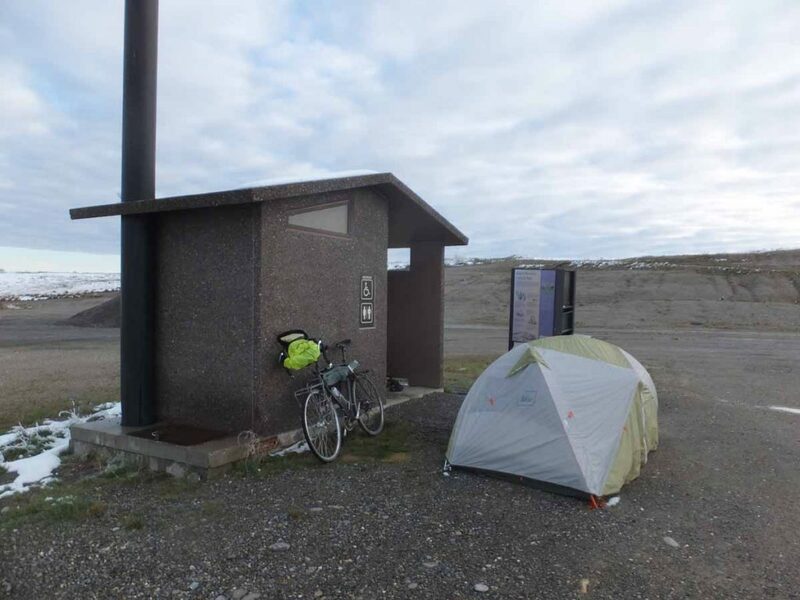 Dhruv hadn’t shown up the previous evening, but learned later he had camped in the snow next to the Swedish cyclists. It took me about three hours to finish the first 20 miles and come past “Happy Valley”. I didn’t see them yet, but three Swiss cyclists had camped there and they came by later in the afternoon. One of the ways we learned about each other was from others on the road including motorcyclists. There were a fair number of them usually decked out with complete gear such as this guy from Slovenia. They would be pretty polite in slowing past and sometimes even stopping and checking on us. As a result, we could also figure out where others were on the road by asking motorcyclists. The day had more hills but nothing too bad. It took me almost 10 hours on the road to cover 48 miles and end up at mile marker 307. There were crews busy here dredging for fiber-optic cable. 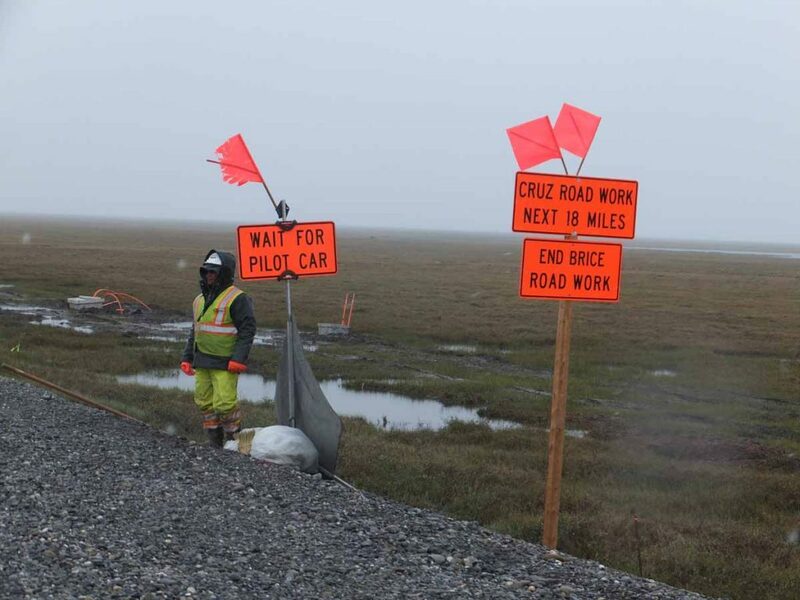 Apparently, plan is to put in cable first to Deadhorse and eventually even over and across the Bering Strait. I’m sure it will be a while. Campsite wasn’t too bad and later in the evening the Swedish cyclists came back and we compared notes Dhruv started with them but was overnight in Happy Valley. 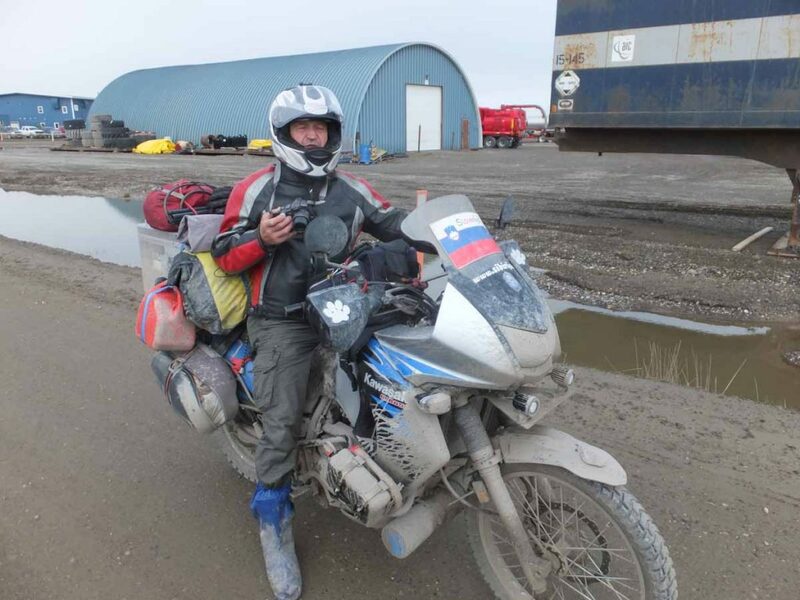 Third day started with some good climbing, first out of the Sag River drainage and then over several other drainages to the Toolik River and eventually to the Atigun. It was another 10 hours on the road to get another 48 miles further. 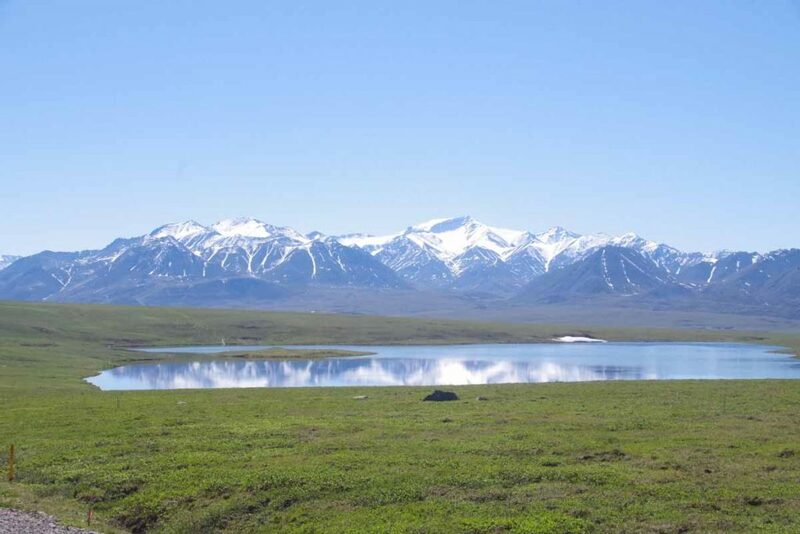 However, the scenery became much more dramatic as the Brooks Range came into view. I had several instances of road kindness on this day including a truck driver that slowed, asked if I was ok, and then reached in to hand a granola bar and also a bottled water. Thanks! I also had a pleasant conversation with motorcyclist from Wisconsin who had ridden all the way there and was really enjoying getting out. I also had a bit of a surprise at one point when noticed my toe plus pedal wasn’t attached to the bike. Apparently, the pedal had come apart and the spindle was separated. However, I was able to stick it together and it lasted the rest of the way. Photo above is Island Lake. Photo above is Galbraith Lake. 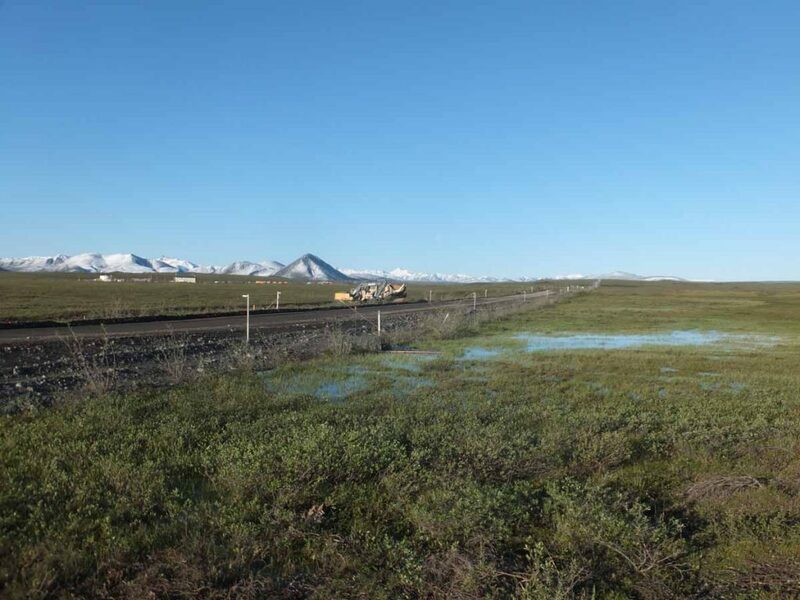 Surprising in the Arctic there apparently isn’t very much annual precipitation here. 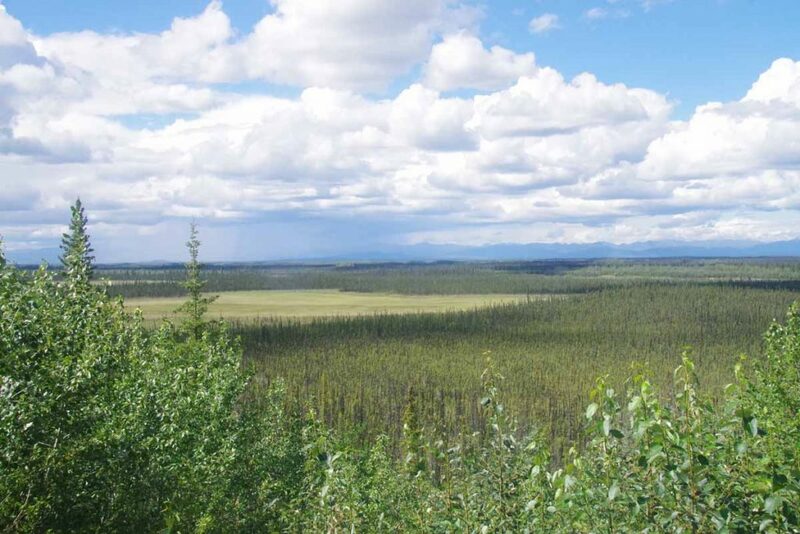 However, since it doesn’t soak below permafrost or evaporate much, it all ends up being a soupy wet boggy region. By end of the day I got to mile marker 259 and decided to stop here next to Trevor Creek. Each day had been successively warmer and it was even hot here. A long ride on the fourth day with a steady succession of goals. The top of the pass was 244, so I was only 14 miles from the top. However, it was also 2000ft higher. The first 10 miles went fairly quickly and were quite pretty as the mountains were up large and the pipeline was also right next to the road. After that, the road tilted sharply upwards, reports of 12% grade in the last two miles. I got off the bike and slowly pushed it up the hill. It was nice steadily seeing my progress as the climb continued. 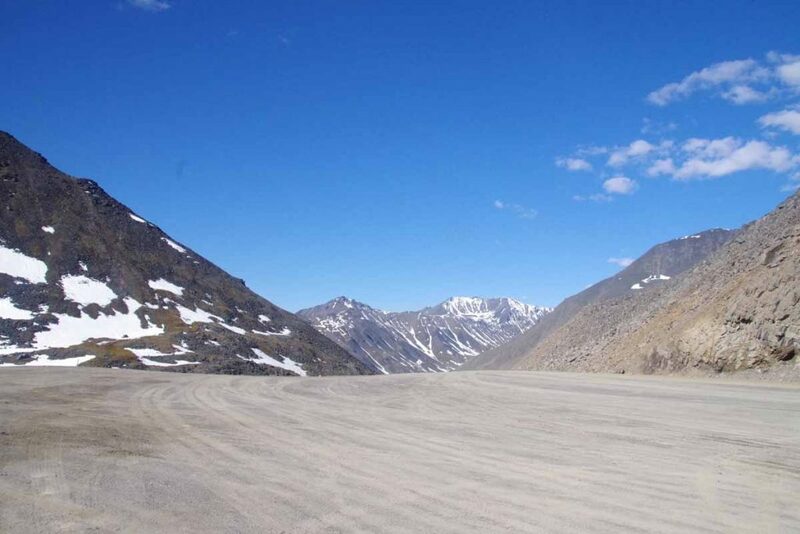 Just as I got to top of the pass, the same trucker from day before came past and again handed out a bottle of water. Photo above it top of Atigun Pass. Made it! Now the descent was almost as treacherous. Another 12% descent on full loaded bike meant some slow going on the brakes. After this some rocky riding to get myself across the Chandler Shelf followed by another 10% grade down into the valley. There was a dramatic change here as I came across the first trees. The “last spruce tree” had been cut by some vandals but there were plenty of others nearby. It had taken me to almost noon to do the first 24 miles but from here the road would be better with half of it good gravel and the remainder even paved. 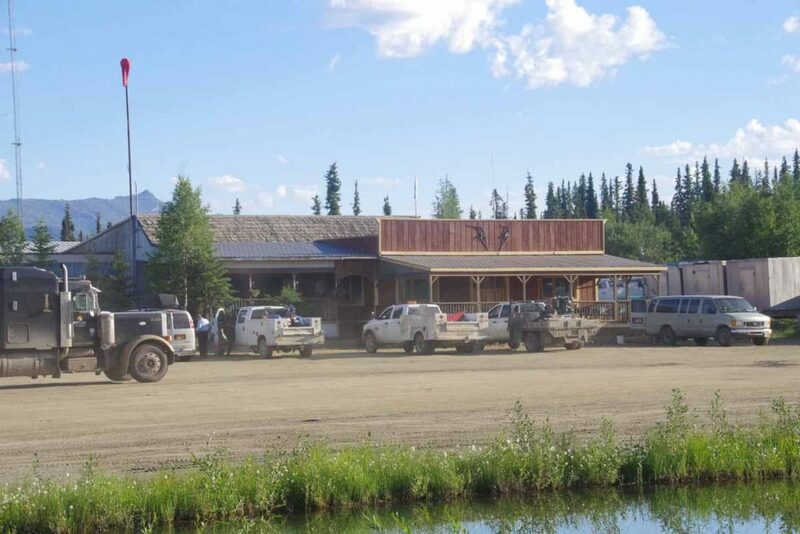 The reward at end of this day would be a chance to reach the Coldfoot roadhouse. So plodded along and continued until later afternoon to reach Coldfoot. 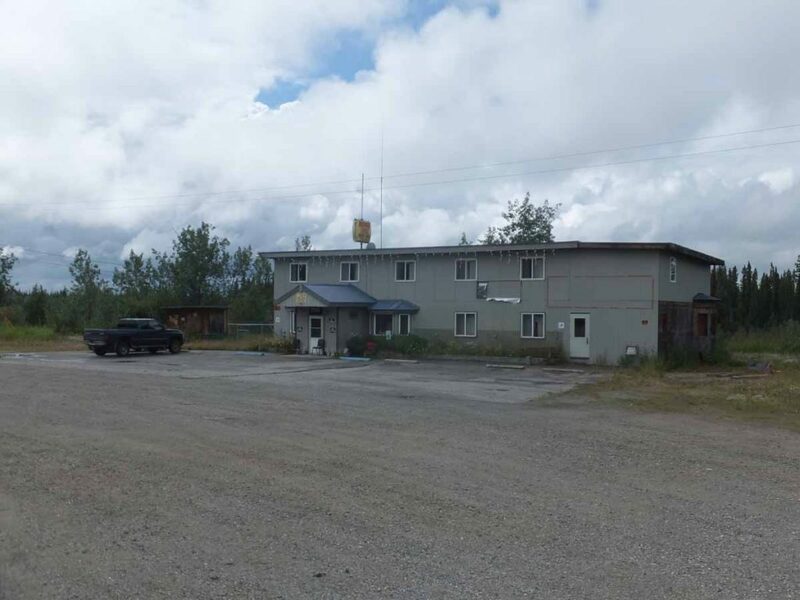 Motel rooms over $200 per night and perfectly reasonable space to camp. So camped, but did pay separately ($14) for a shower as well as later to do laundry. Took a rest day in Coldfoot and relaxed and watched the world go by. First day from Coldfoot was reasonable cycling. 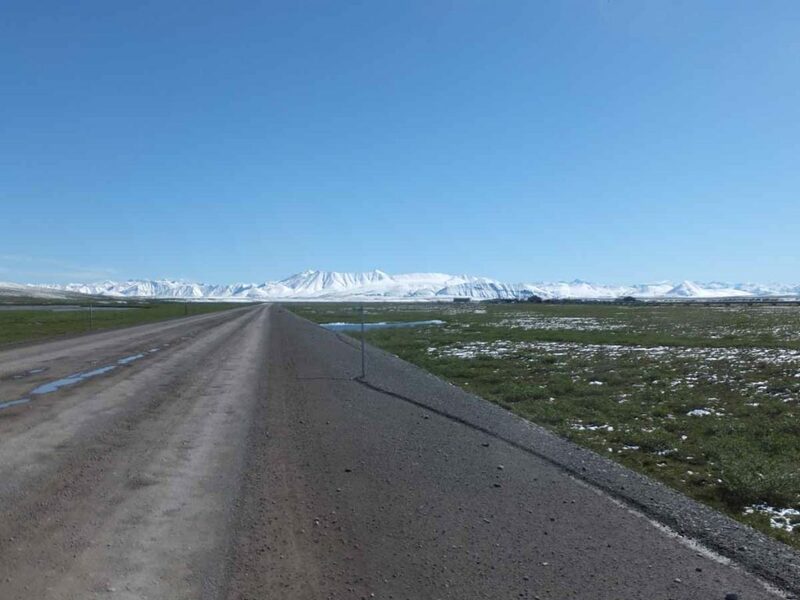 The road was at least nominally paved, though there would occasionally be longer gravel patches. 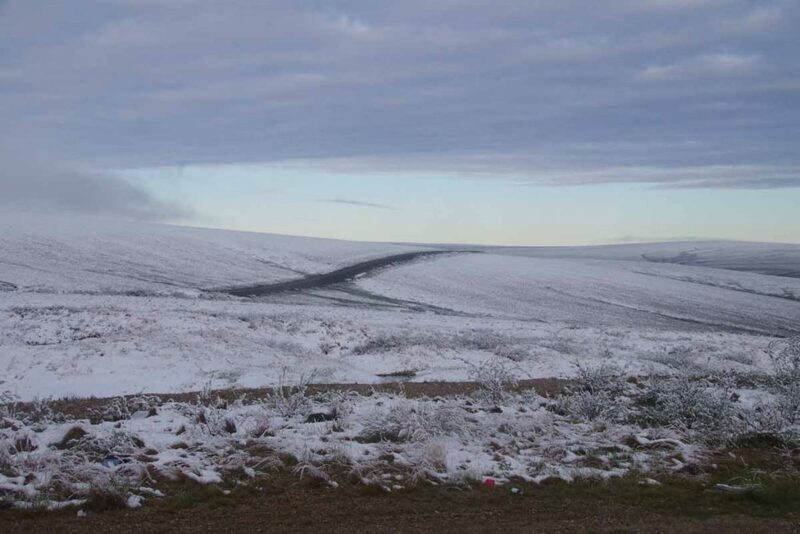 There were also a few shorter steep hills and a longer climb to Gobbler’s Knob at mile 132 then several climbs getting close to the Arctic Circle. Obligatory tourist shot at the Arctic Circle. Obligatory shot of the road sign. 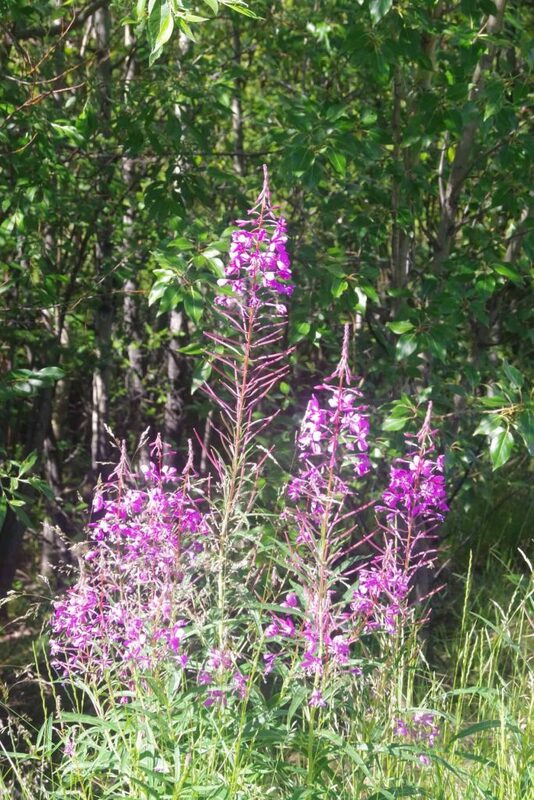 Slept last night a Fish Creek, mile 114 of the Dalton Highway, just a mile south of the Arctic Circle. Lovely campsite with my tent nestled under the trees. I had gone to sleep early, it is light all the time and by 4am I was well rested. I heard light ticking on the tent and couldn’t quite figure out if it was mosquitoes bumping against the nylon or light rain. Got up and found it was a very light and intermittent rain. Got out the stove, boiled water and added it to the prepackaged eggs and bacon meal. Otherwise fixed things up and was on the road by 4:45am. Until mile 90, this part of the road in nominally paved, though there are large. gravel breaks. Just a few miles down the road, the road climbed 9% grade up over Beaver Slide. Total climb was well over 1000ft and I walked most of it. After that more ups and downs and break to filter more drinking water at mile 105.7. I carried extra this time. Thermometer said 8C and there was bit of rain and stronger wind. I had another good climb to Finger Mountain whose summit was at mile 98. Those first 16 miles took several hours but I was not in a big rush. At the top, I saw one of the groups I’d been leapfrogging, three Swiss cyclists. They were still camped and didn’t pass later so may have avoided the wet and mud. In hindsight a good choice. Four miles later, came past the two Swedes on their way to Ushuaia. Almost packed and ready to go. They were looking damp and almost out of food, so were happy when I told them the Yukon River had two cafes at mile 60 and 56. I rode past but they quickly came past me. From then, I could see their tracks. At mile 90 the pavement ended and it suddenly became more difficult. I’ve figured out there are several different types of mud here and we started out with “peanut butter”. Soft, gooey and slippery. Avoid going too fast, particularly downhill or you’ll slide out. Continued to have some good hills and I walked parts here as well. It gradually firmed up and I slowly made my way. At mile 79 I passed my bailout camp location, but didn’t look too interesting, so kept going. Unfortunately, despite it starting to dry some there was more mud of type “adhesive paste”. It sticks to itself and everything else. It caked under my fork and brakes and jammed stuff up, requiring me to stop and free things. At mile 75 it happened. The adhesive paste jammed my chain and before I knew it the torque busted the derailleur cage and broke the derailleur mounting (no hanger on this bike). Broken! Now what to do. There was still too much paste to shorten the chain to single speed and hills would have been tough. So I walked and periodically look back to see at passing pickups for a ride. Several passed but few stopped. So I walked. At mile 72, I came paste the Swedes. Also, done in by paste. One internal hub jammed up and not working, they also decided to hitchhike, though rather than my walking approach, they sat in one spot and tried to flag vehicles. I walked some more. Pleasant and sympathetic folks came past, including ones who offered me a coke. It wasn’t sure and most didn’t have room. 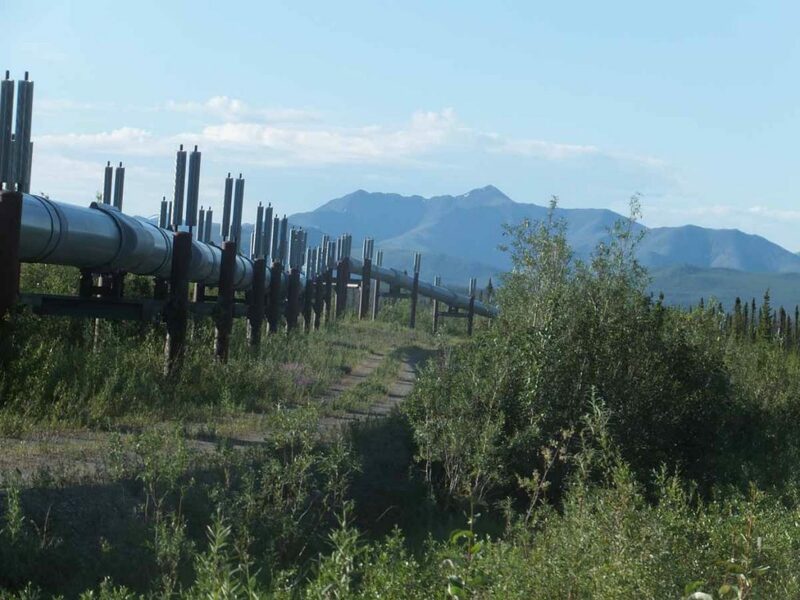 The Alaska Pipeline pickups must have a policy since four passed but none stopped. Finally, after seven miles of walking, just past mile 68 a nice German-speaking couple stopped. They had a small camper and were willing to help with my request for ride to Yukon River Camp at the bridge at mile 56. We had to be careful to knock as mud off the bike as we could to avoid making a mess. Very much appreciate the ride. 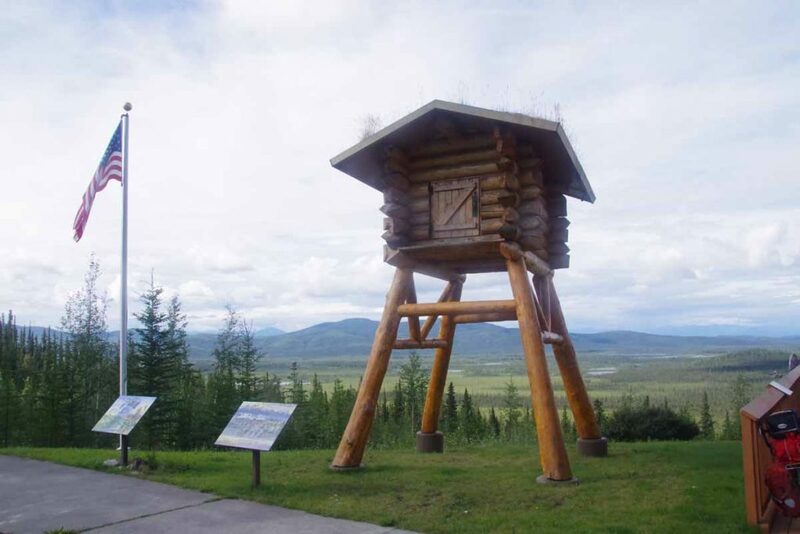 At Yukon River Camp, assessed the next situation. 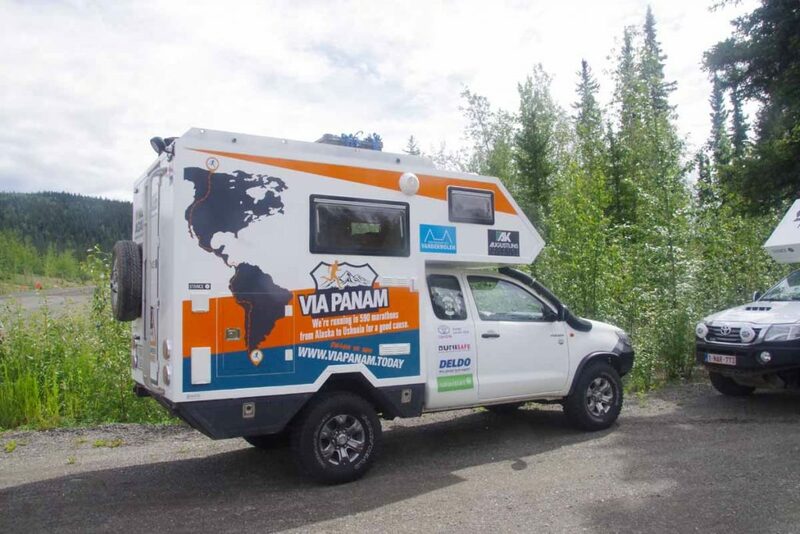 Fairly quickly a tour van doing round trip a Arctic Circle stopped on their way back. Driver had room for a person but not a bike. I stored my bike and gear and then rode back with them. Again, very much appreciate kindness of strangers here. What is next? 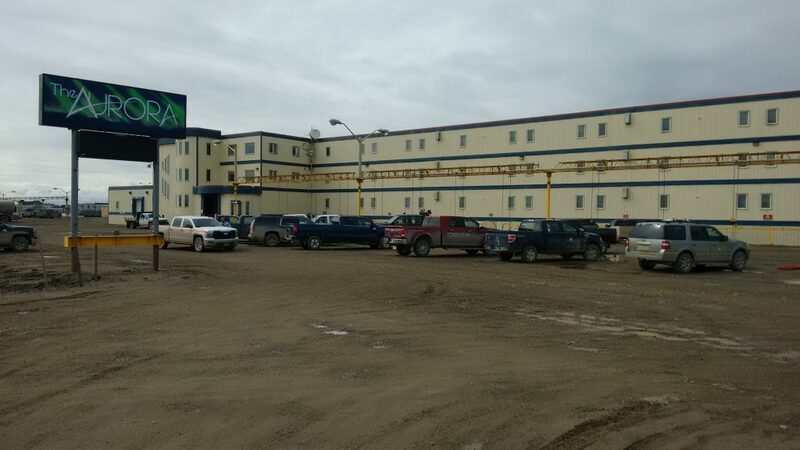 I am in motel within walking distance of car rental agency that advertises rentals for the Dalton Highway. 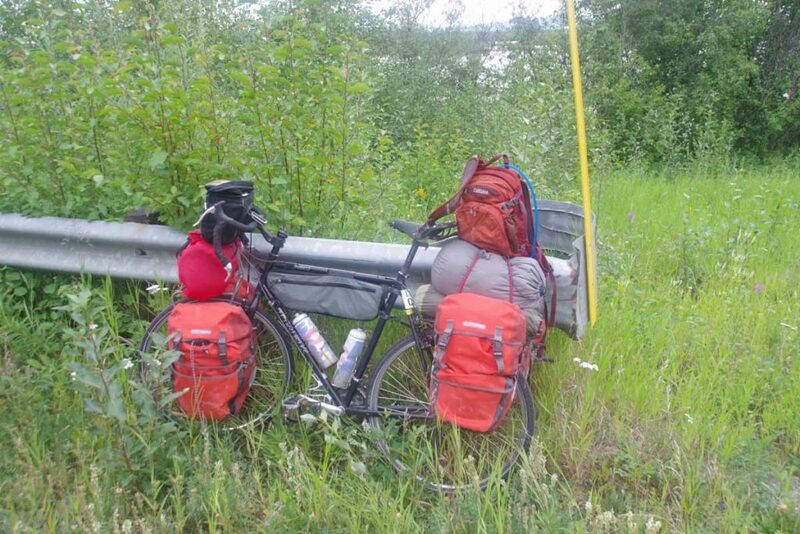 Tomorrow when they open plan is to rent a car and drive up to retrieve the bike and bring it to Fairbanks bike shop. After that will sort out what comes next. Not exactly the original plan, but best possible and again very much appreciate the assistance I received today. Four days of riding brought me to Coldfoot. Today (25th) is a rest day here. Tuesday, 30F and snowing. The weather forecast had said finishing by 2pm but it kept all day. Rode 48 miles of sometimes muddy gravel road and had to take a pilot car through 4 mile construction zone and another 8 mile construction zone to end up at mile 355. Thursday, crossed multiple drainages to come close to the Brooks Range. Good views of the pipeline. Took close to 10 hours on the road to get 48 miles again. Camped next to Trevor Creek beside the road. Friday, long and spectacular day. I was 14 miles and 2000ft before the pass. First 10 miles weren’t bad and then the uphill started for real. Reached Atigun Pass followed by descents of 12% and 10% on loaded touring bike. After reaching first spruce tree the road became considerably better, ~26 miles of smooth gravel followed by 34 miles of pavement, following river valley. It was a long day of 13 hours in the saddle but given choice between freeze-dried eggs and buffet dinner, pushed on. Today pretty relaxing watching the world go by in Coldfoot. Burst of activity in morning as all gets going followed by morning lull. As evening approaches busier again. Reminds me a bit of Australian roadhouse. Photos will have to wait until Fairbanks. Started out with someone from Delhi, though got ahead as he was even slower than my snail pace. Will see if we meet here. Could still take 5-6 days from here pending road conditions. 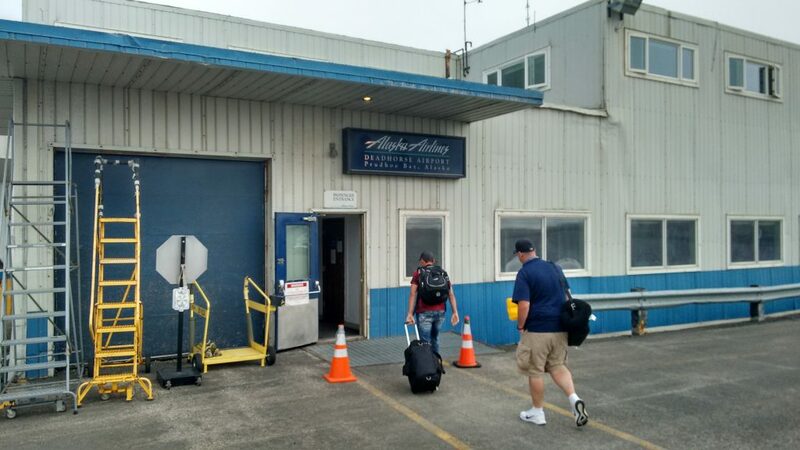 Flew into Prudhoe Bay airport this morning. It was 40F (5C) but sun was almost poking through and roads were dry. This entire area has a sense of industrial work zone to it with large dirty trucks and buildings constructed from bolted together prefabricated components. A typical schedule for workers is three on (every single day) followed by three off (and flight back). 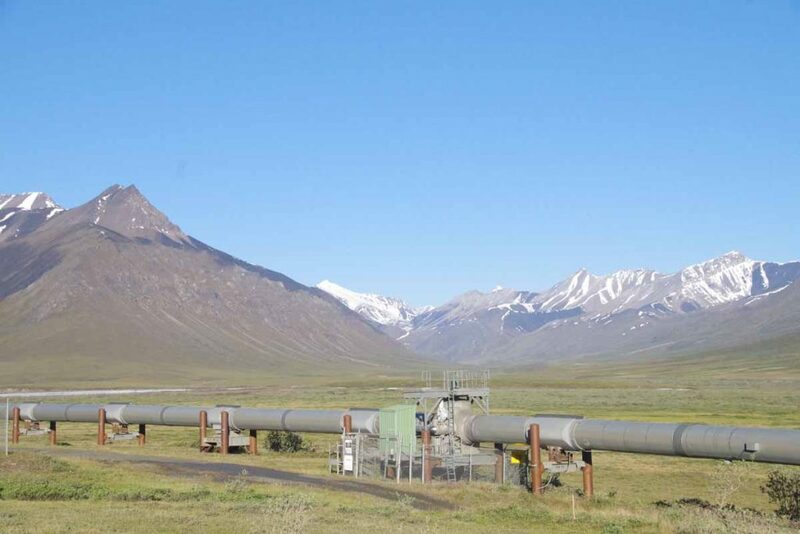 The Aurora caters mostly to various oil field workers but does a space available for tourists. Outside each parking spot has a dangling cord to plug in your block heater during cold months. There aren’t independent restaurants here, instead the hotels have cafeterias included with prices. I parked my bike inside in foyer as weather forecast is for rain/snow overnight. However after tomorrow looks to improve. Otherwise walked over to the general store/post office to pick up an isobutane canister which I had sent general delivery. Here I was told standard procedure was to call and ask for an address and that I was lucky it hadn’t been sent back. My stove can also burn gasoline but I like isobutane since it burns cleaner. This morning packed everything into minivan and drove to the airport. 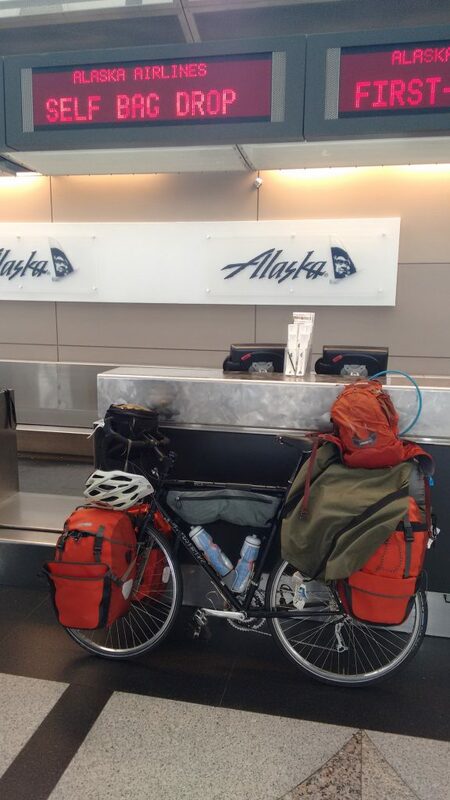 I had given myself plenty of time to find a bike box and to get through security and fortunately both went smoothly. 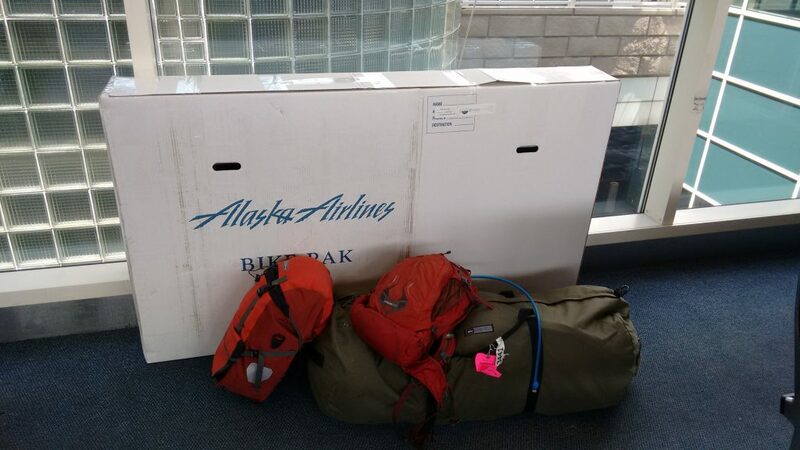 I had not weighed my gear but moment of truth came when I brought my bike box (48 pounds including a frame bag with tools) and my duffel bag (48 pounds as well, fortunately below the 50 pound threshold for oversize). That didn’t include my carryon pannier containing 8 days of food or my camelback. However I was pleasantly surprised it came at under 100 pounds. My informal wish had been 40 pounds of bike+racks and 60 pounds of gear so once I reach Fairbanks and have eaten contents of the food pannier, it won’t be too far off. In comparison, I remember my bike and gear coming in at 140 pounds when I left for Africa and at 100 pounds when I departed for Australia. I also got answer to question I had about buying a lighter in the airport. Newstand had them so I now have something to light my stove. Uneventful flight to Seattle, several hour layover and then another uneventful flight to Anchorage. 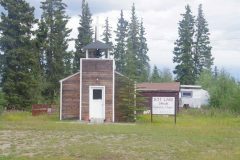 A short overnight here and then a flight tomorrow morning to Deadhorse. 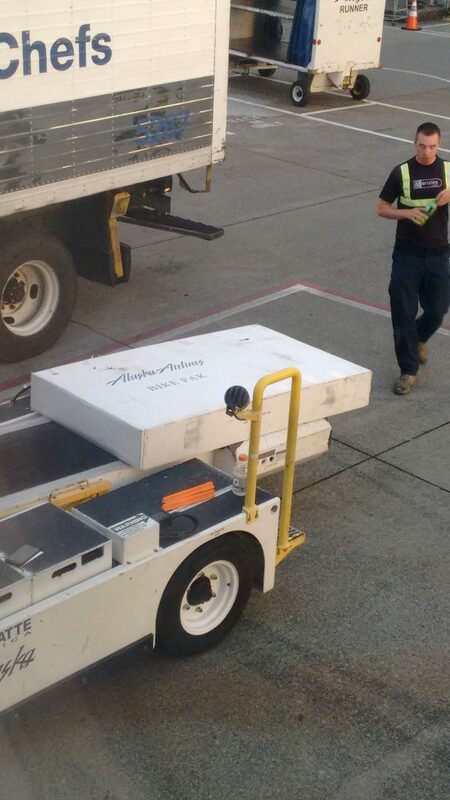 Photo below from Seattle shows my bike was loaded on the plane. Some notes about the road ahead to Fairbanks. 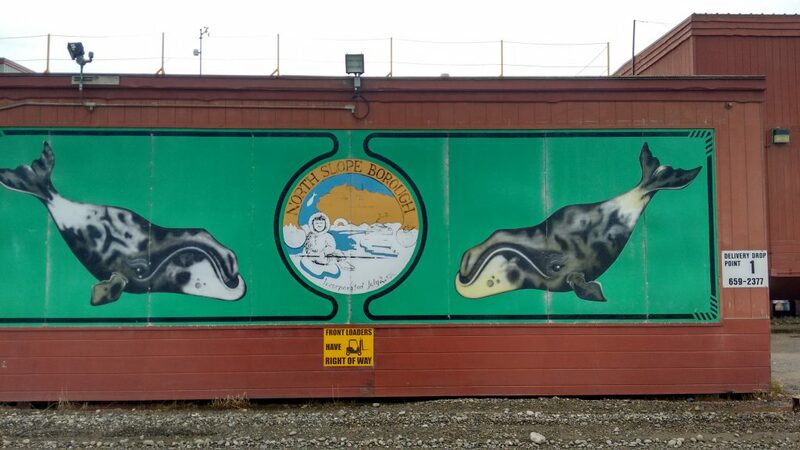 I am fairly certain I’ll find cell service and wifi in Prudhoe Bay and post a “starting the trip” photo from there. However, just in case there are access issues, after that point there won’t be anything posted until Fairbanks, which I plan to reach at very end of June. 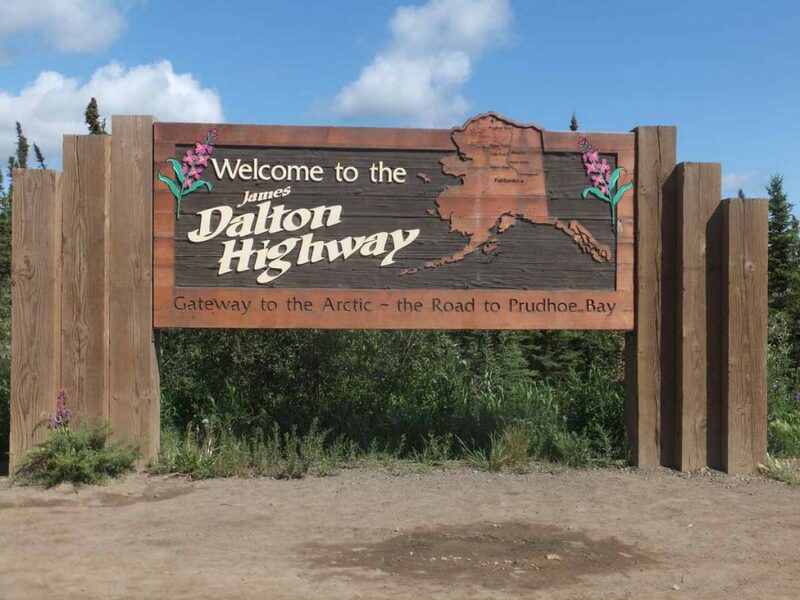 I’ve ridden the Dalton Highway once before. It is 500 miles including 300 miles of gravel. I expect it to be one of the more challenging routes in US/Canada partially because it comes first and partially because of the road and weather. Should be a good test of gear and overall “boot camp” for my minimal training. On the flipside there is a fair amount of traffic so one isn’t truly isolated if you get into trouble. Looking forward to the ride. Bought a plane ticket. 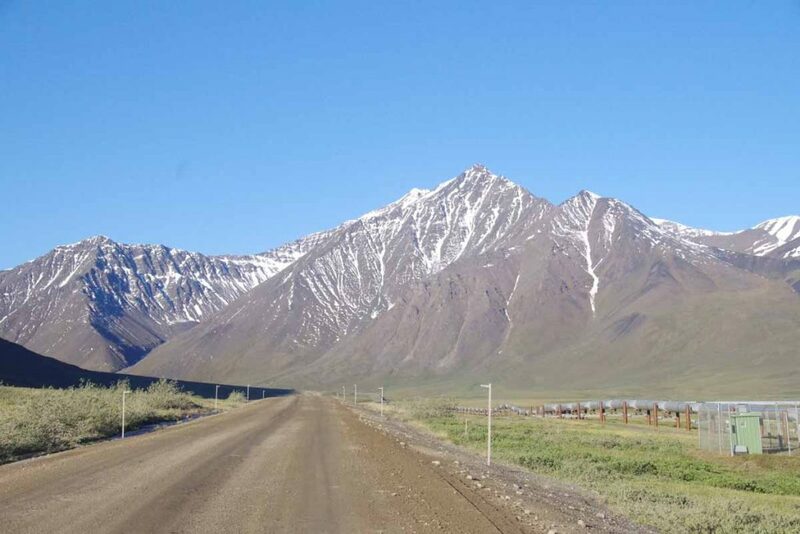 One way from Denver to Prudhoe Bay leaving on June 19th and arriving on June 20th.